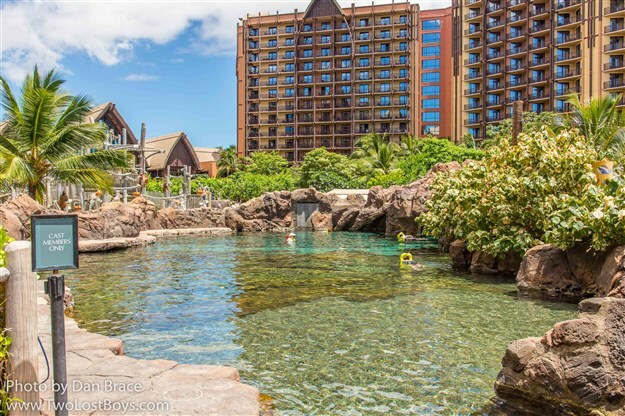 The pool around the resort is a really quite neat and very well integrated, with a very natural and organic feel to it. 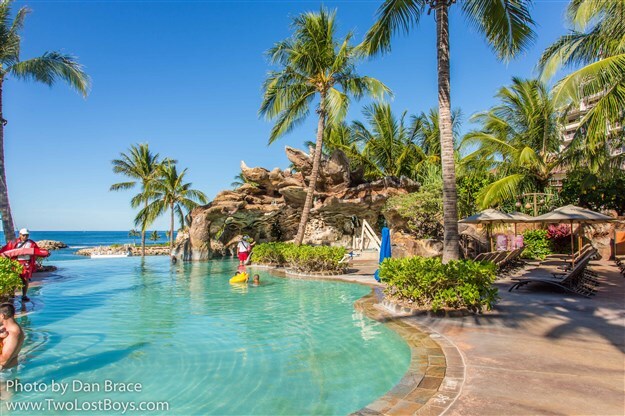 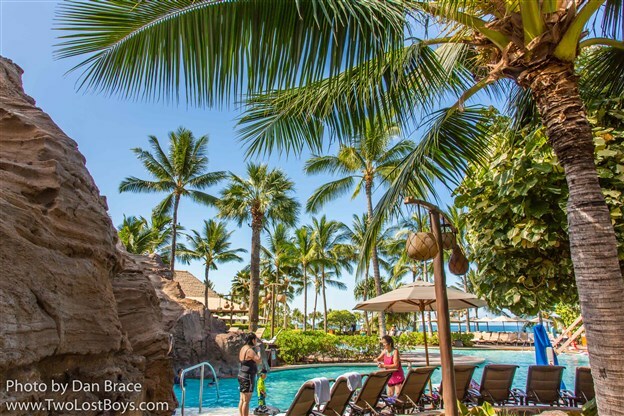 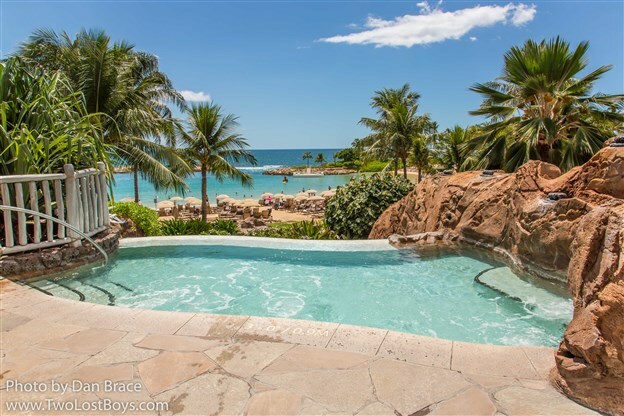 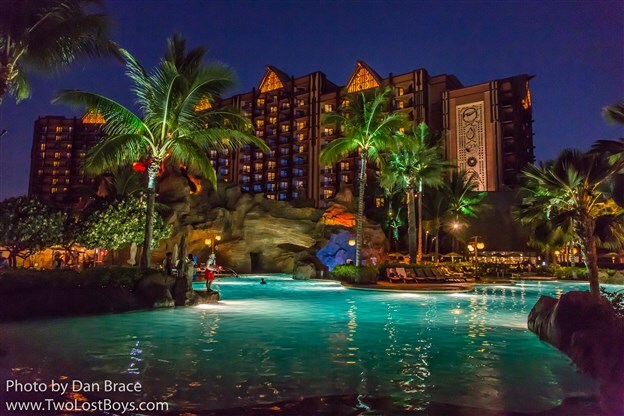 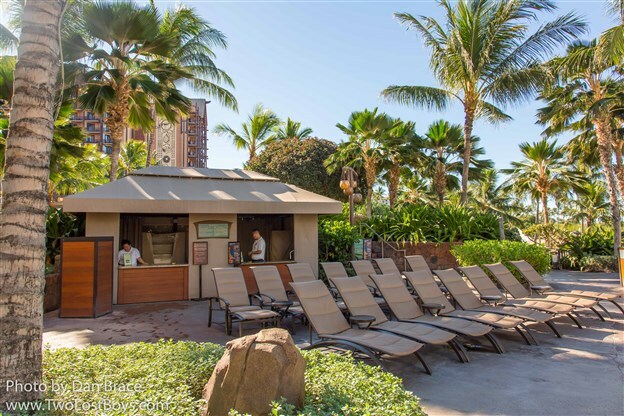 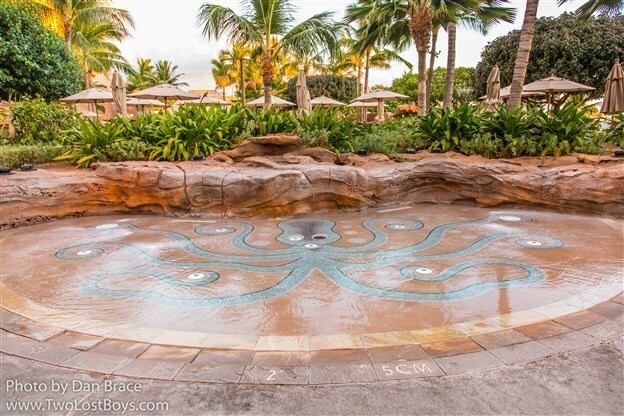 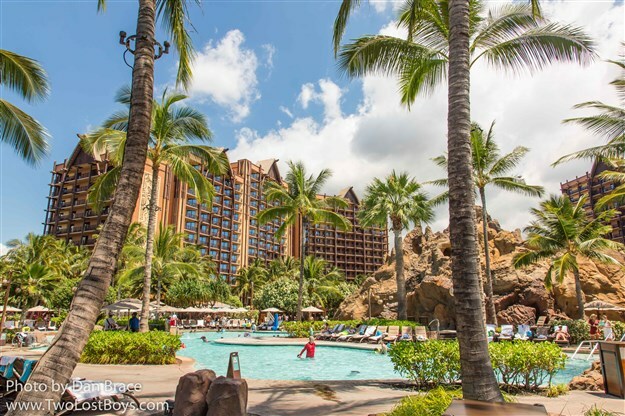 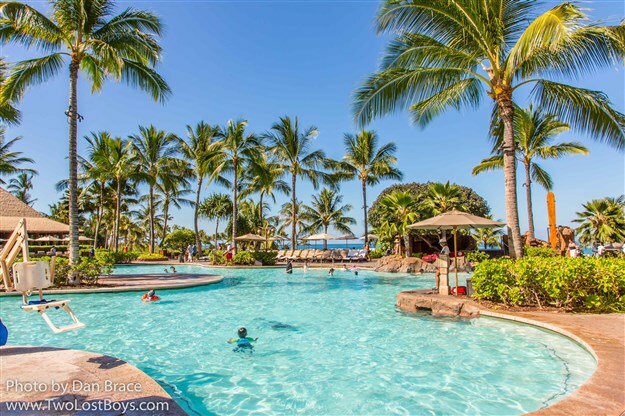 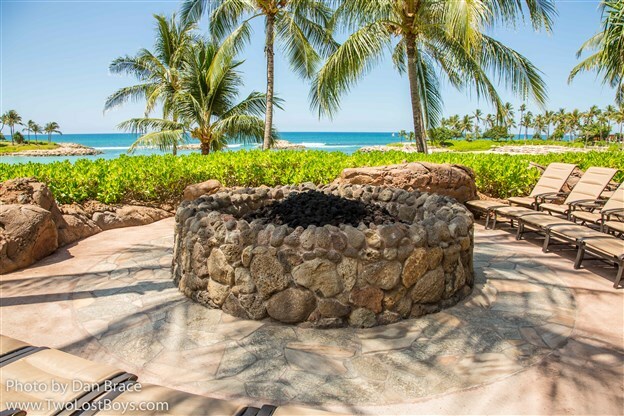 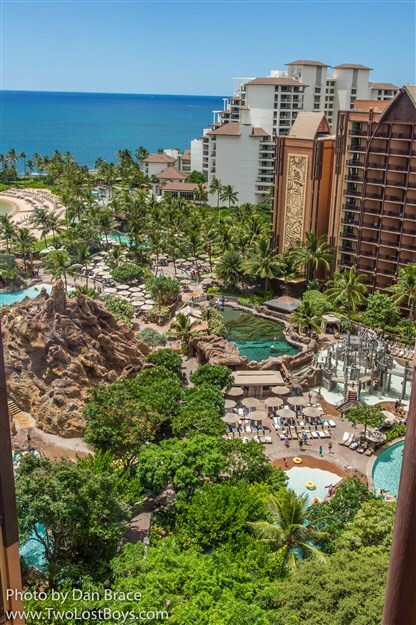 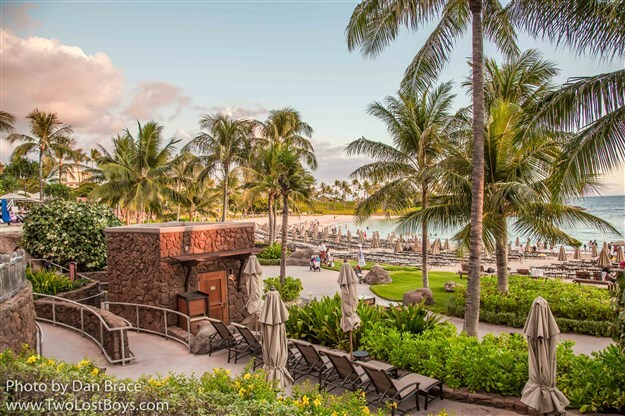 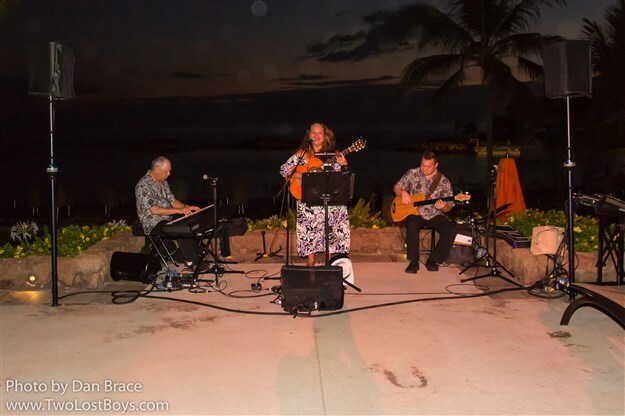 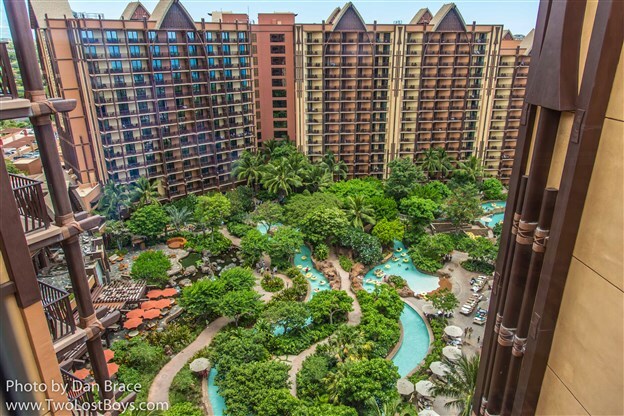 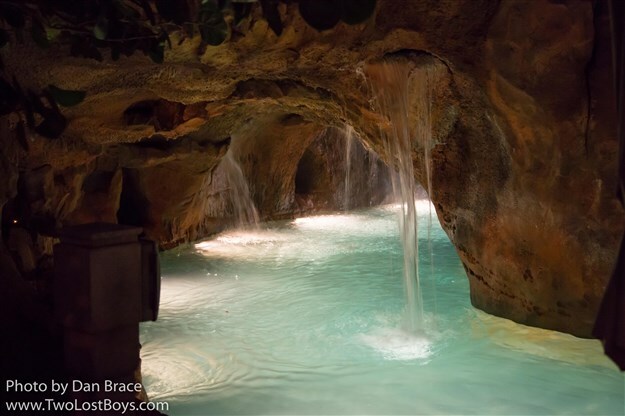 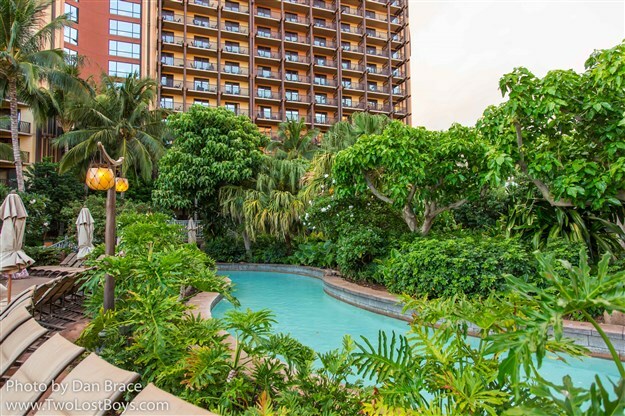 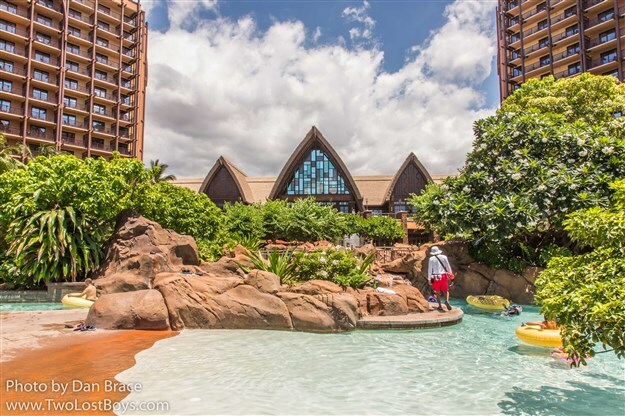 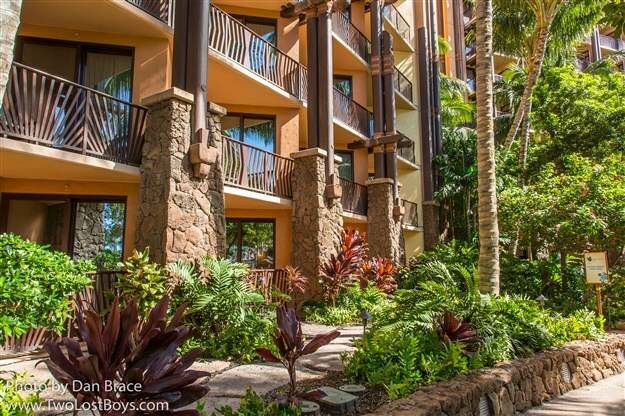 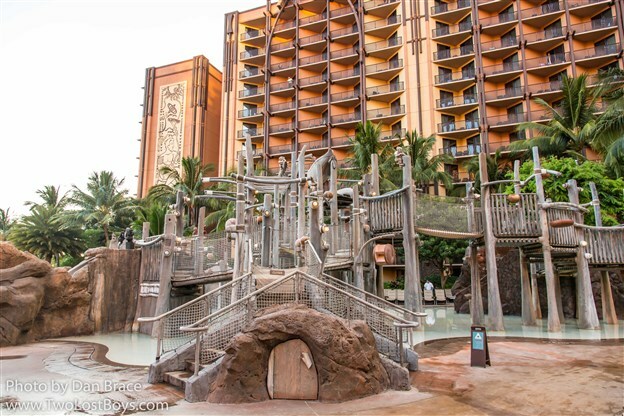 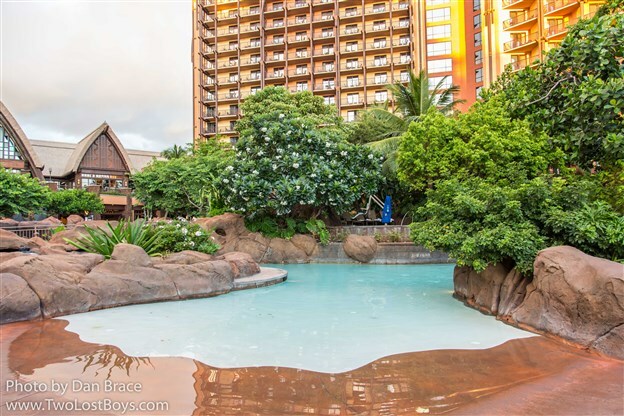 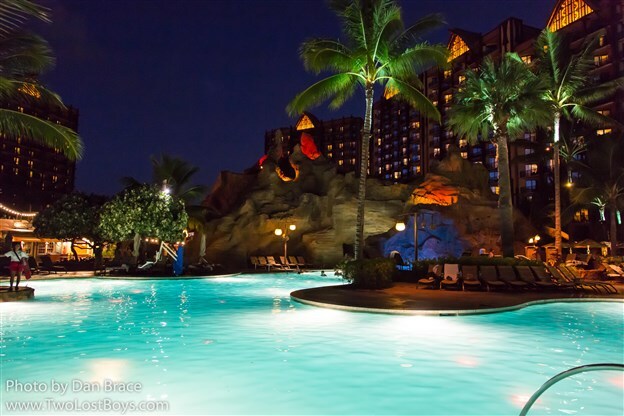 There are several key areas, including a Menehune bridge (I talked about the Menehune in part one), the main pool itself, waterslides, and various smaller pools and whirlpool spas, some of which are exclusively for adults. 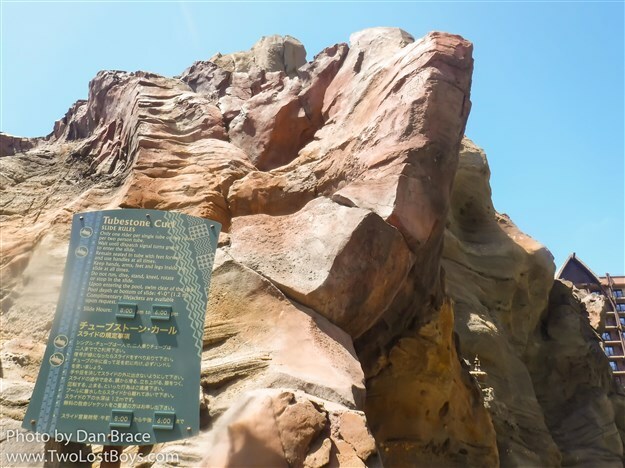 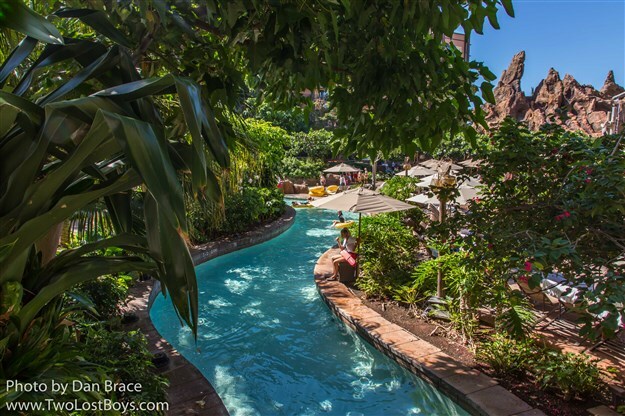 In the middle of the valley is a small mountain, within which lies two water chute attractions that connect to the pool areas. 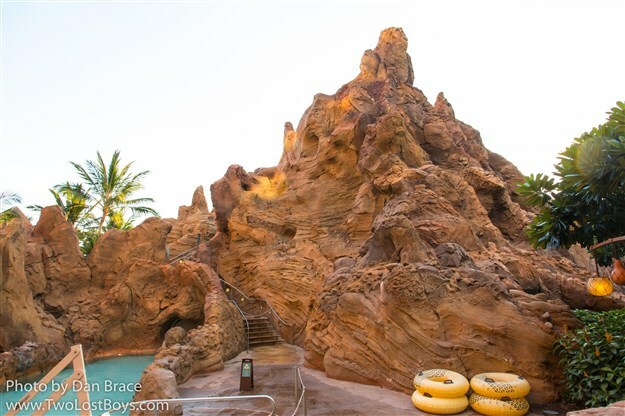 One slide you go down without a rubber ring/dinghy/inner tube, the other one you can sit in your inflatable vehicle and careen through the mountain into the lazy river area. 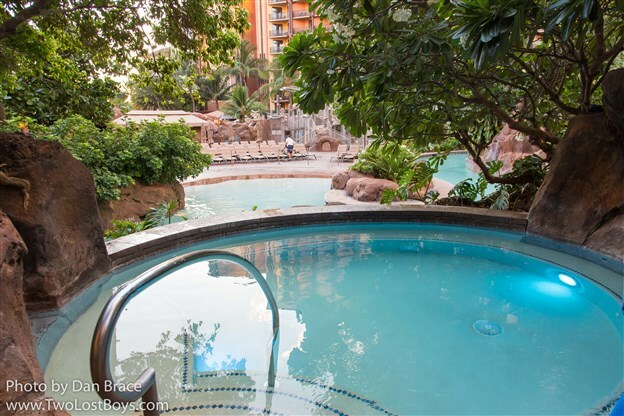 I am not a pool person really, but I had to try the latter one, and it was a lot of fun! 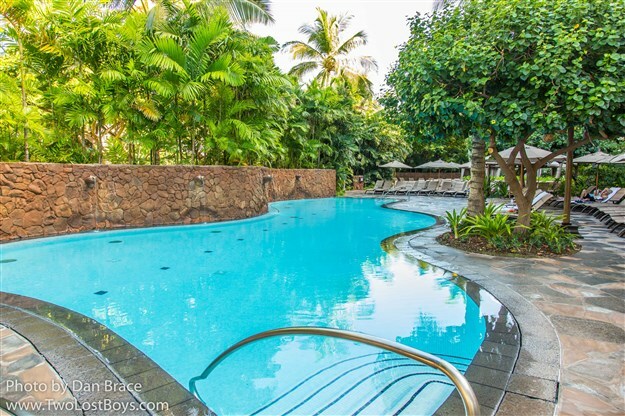 Separated from the main pool area, but not all too far away is the adult pool, which is set in a shady corner out of the way of the main valley. 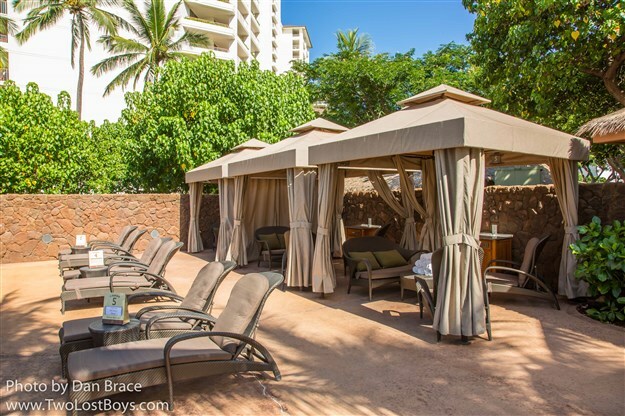 On the western side of the pool area are some cabanas which are available for rental. 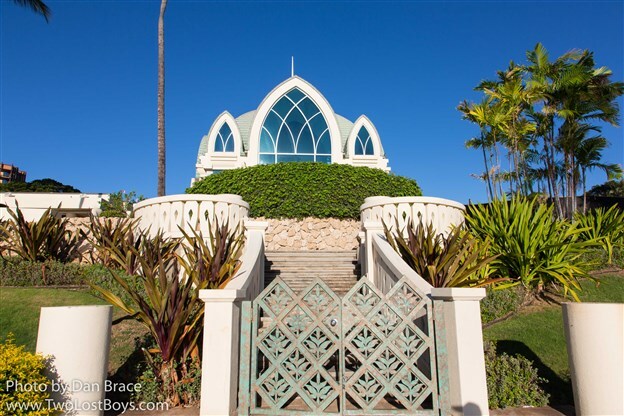 From my recollection, they are extremely expensive to rent - somewhere in the hundreds of dollars. 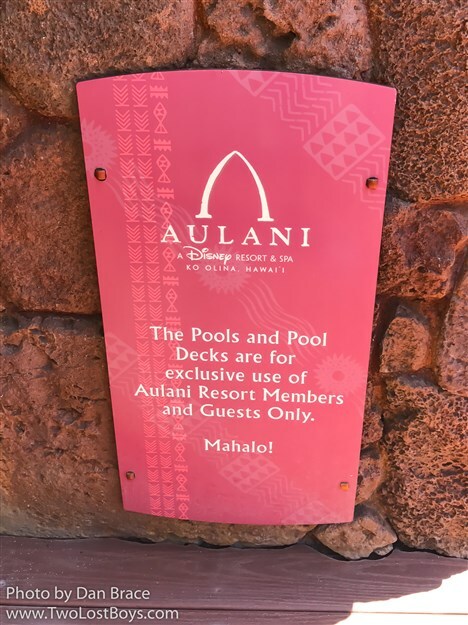 Honestly, I am not entirely sure what the over all benefit is - if you're in the pool, you're almost certainly staying at Aulani. 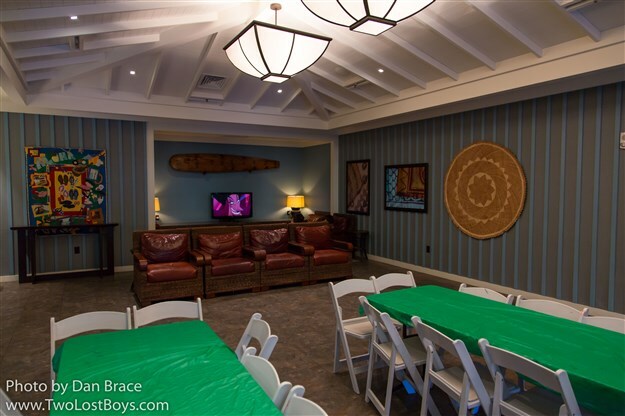 It seems ridiculous to pay hundreds of dollars to rent a tent to change clothes when you can just go to your room. 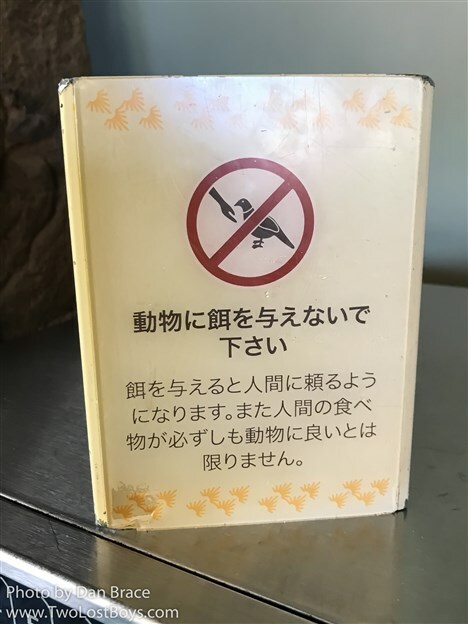 I'm sure they're useful to someone, though. 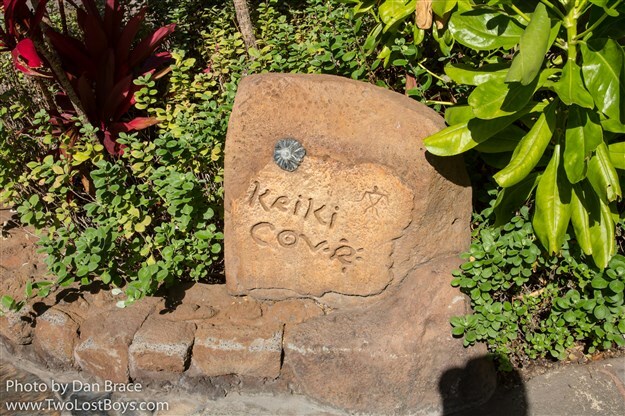 There are a lot of signs around the resort, as you can imagine, but what is interesting is that nearly all of them have Japanese on them - there are a lot of Japanese guests at Aulani, so much so that all the signs are in Japanese, in addition to English. 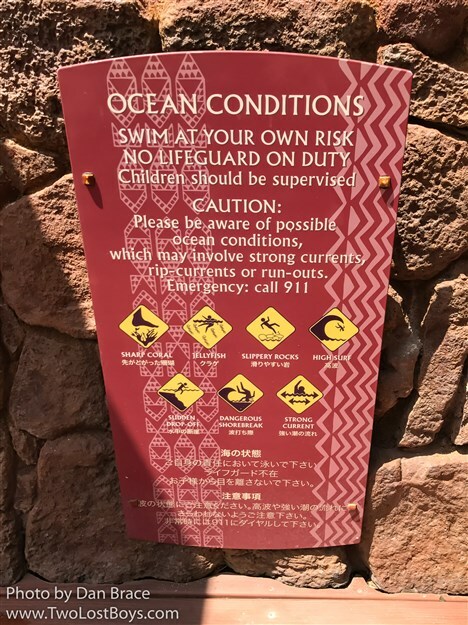 While we're talking about signs, and still around the pool area, take note of the signs, below. 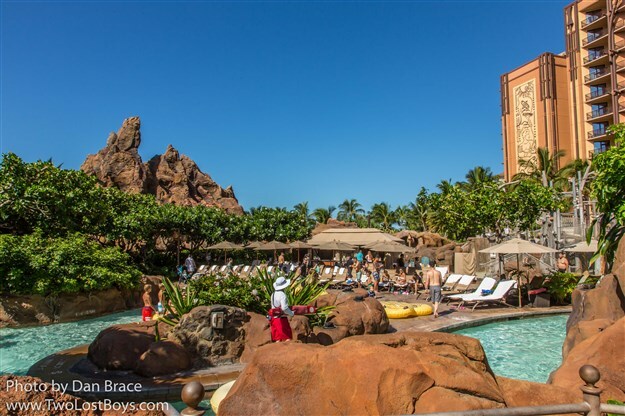 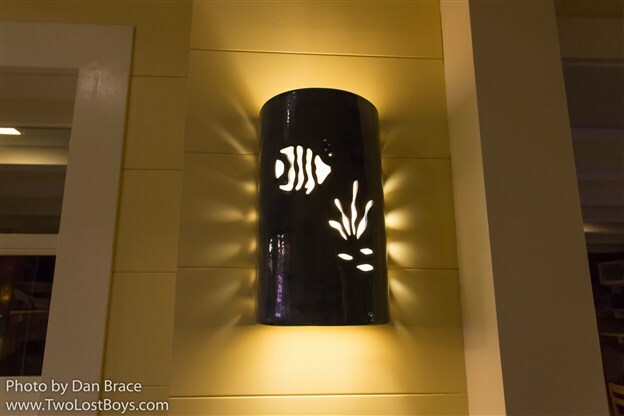 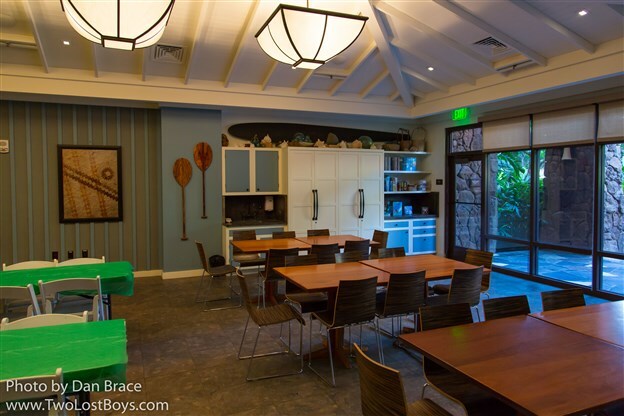 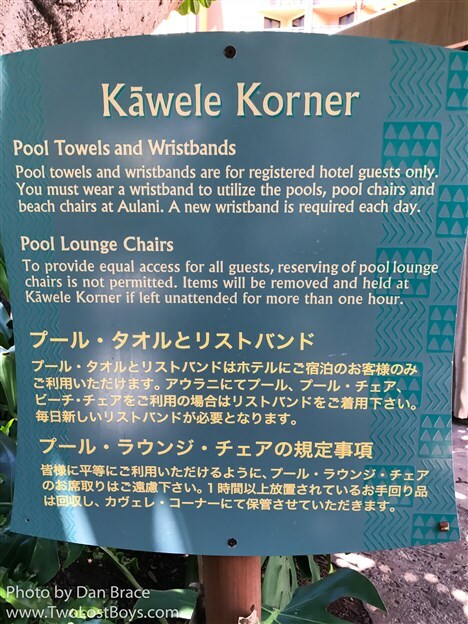 When staying at Aulani you must get a wrist band each day of your stay, at Kawele Korner down at the pool area, to prove that you are a resident guest of Aulani. 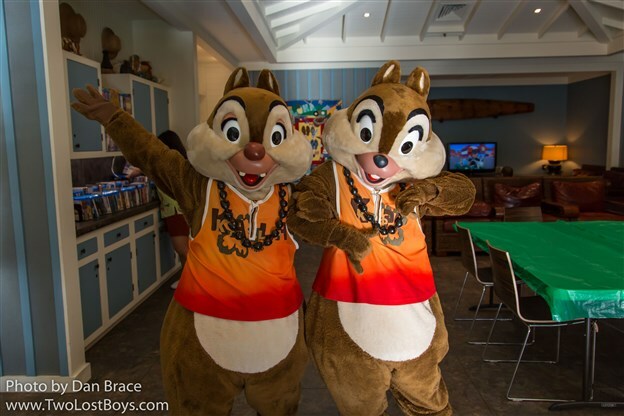 Wristbands will be checked at nearly any activity you partake in, including character greetings. 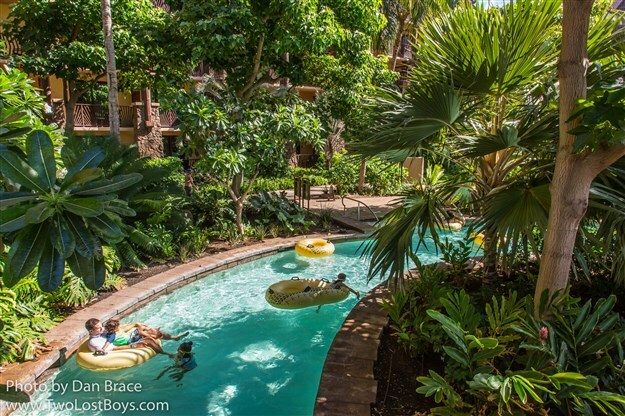 I keep mentioning the lazy river - known as the Waikolohe Stream - and so finally we come to it! 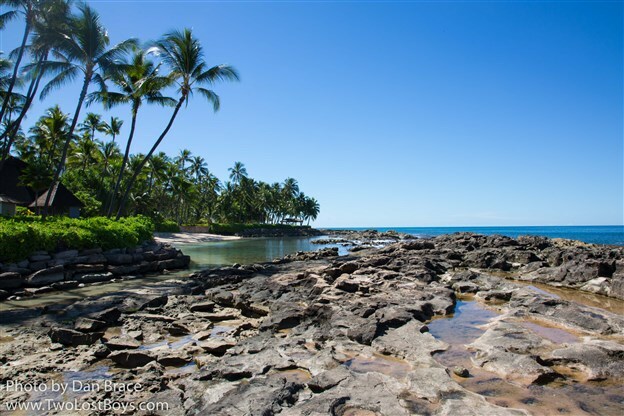 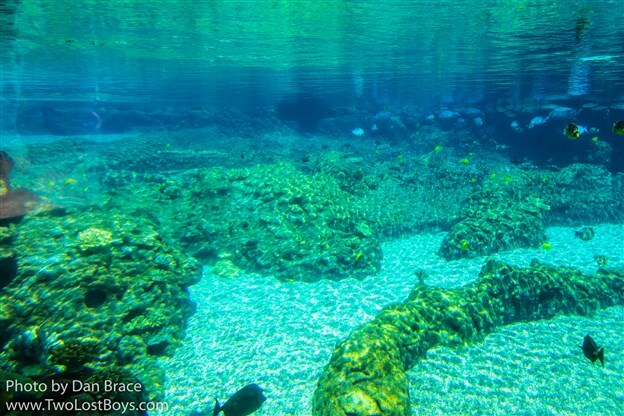 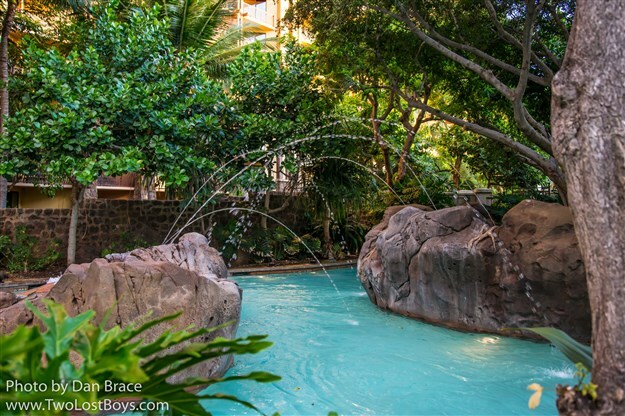 The lazy river intertwines its way around the Waikolohe Valley and pool areas, and can take any where up to fifteen to twenty minutes to complete. 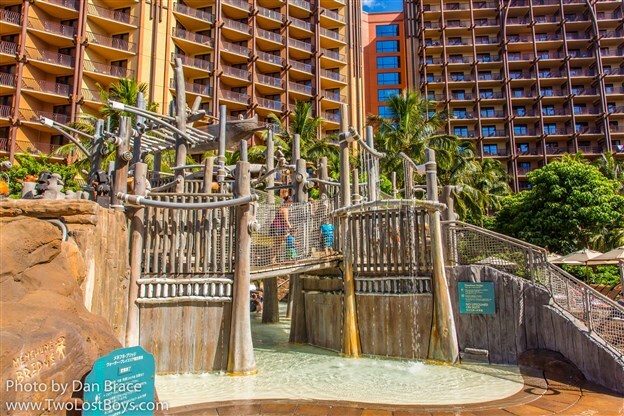 You can sit on the rings all day going around, if you like, and there are multiple entry and exit points. 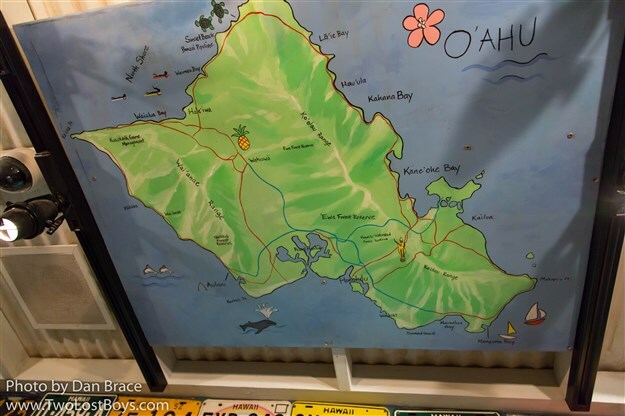 We did it once, and it was pretty neat. 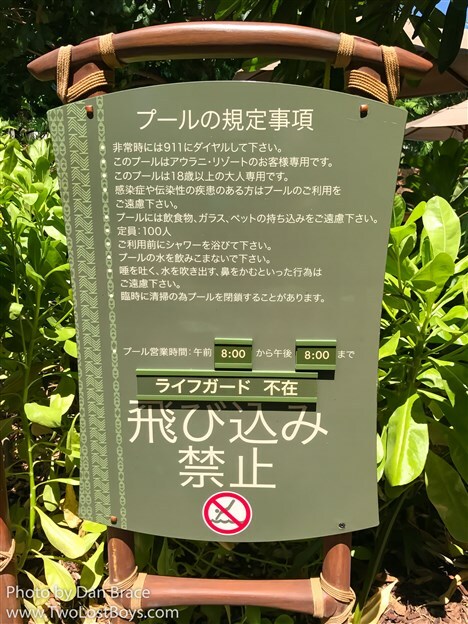 I mentioned above the Japanese influence on the resort, and this even stretches to the fact that many of the cast members are Japanese, and if they aren't then they actually speak Japanese! 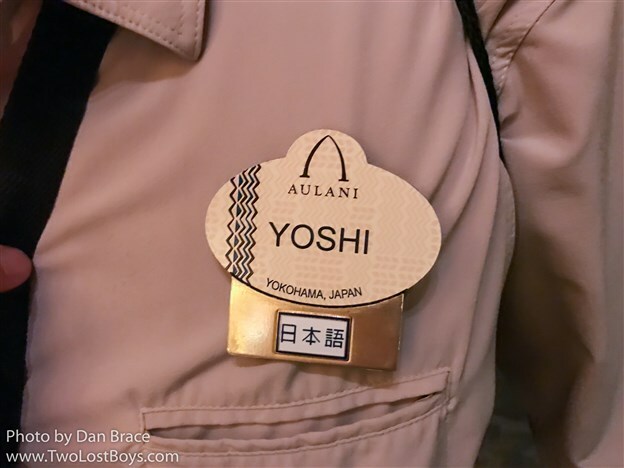 The name tags at Aulani are also unique, so I politely asked, and took this photo of Yoshi's name tag. 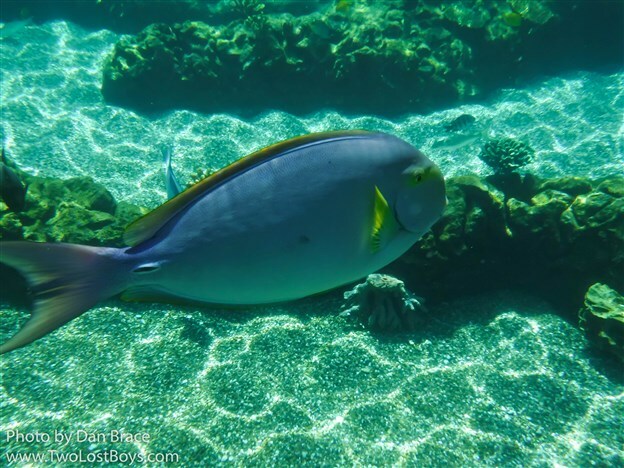 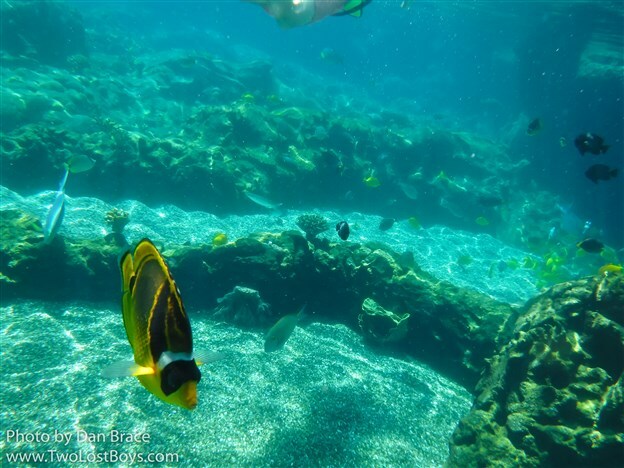 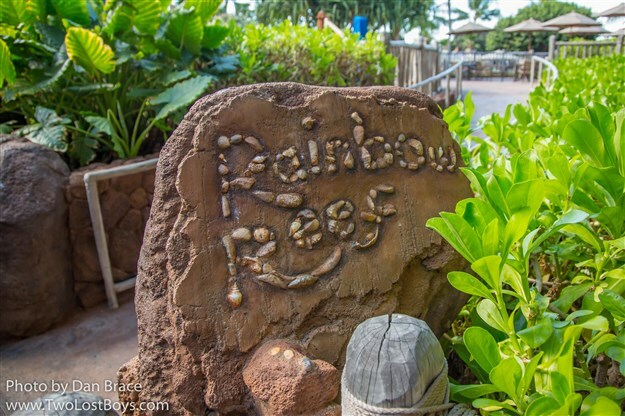 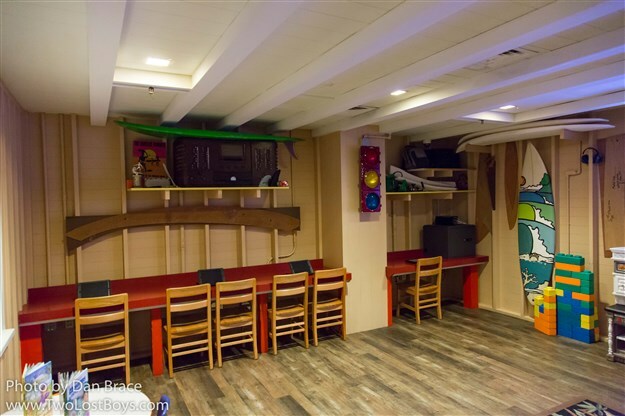 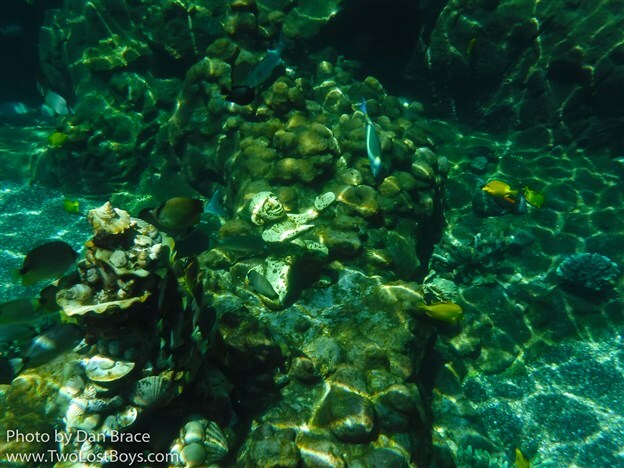 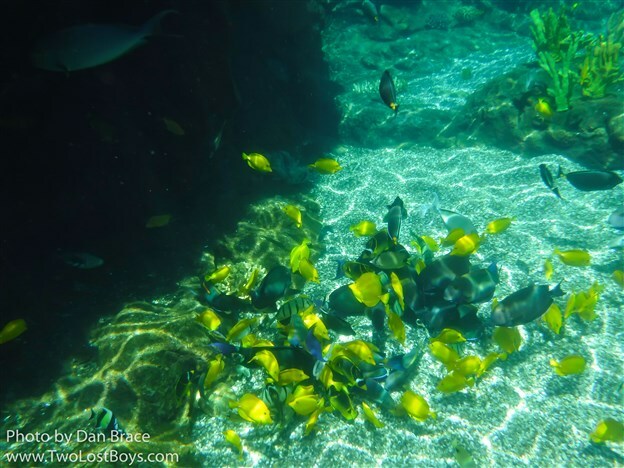 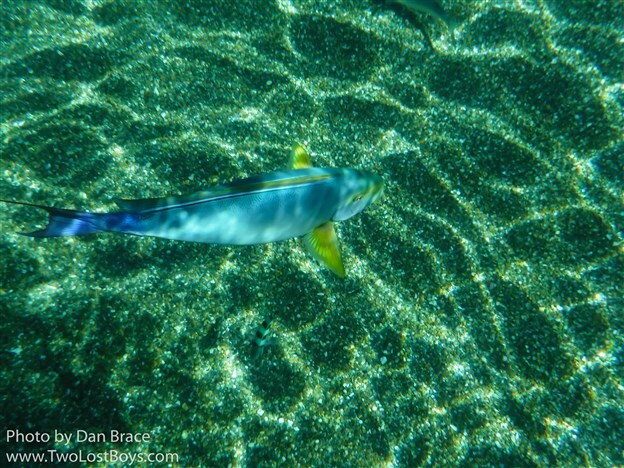 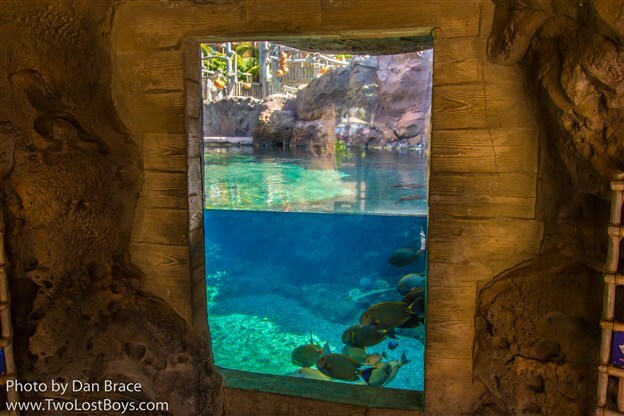 Sticking with the pool area for the time being, we now come to Rainbow Reef, which is where you can snorkel with fishes in a safe, manmade environment. 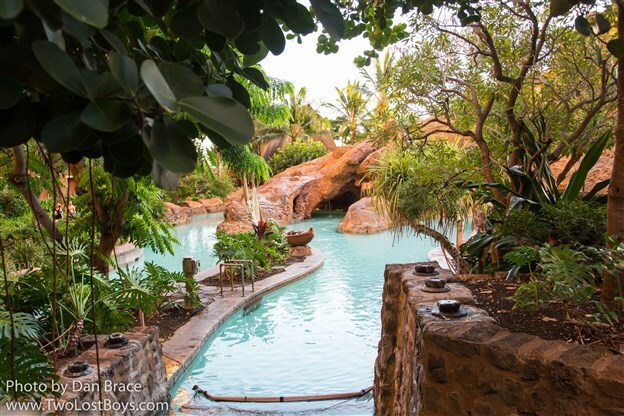 You have to pay to do this, but you get to come and go all day, if you wish, or even buy a ticket for several days of your stay. 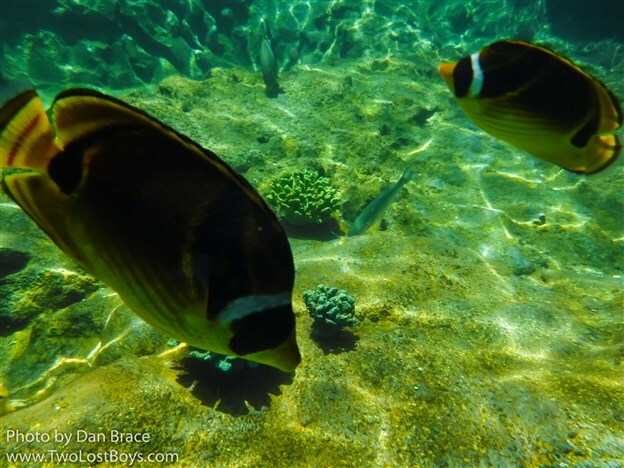 Snorkelling is not something I do well at, at all, but I gave it a try. 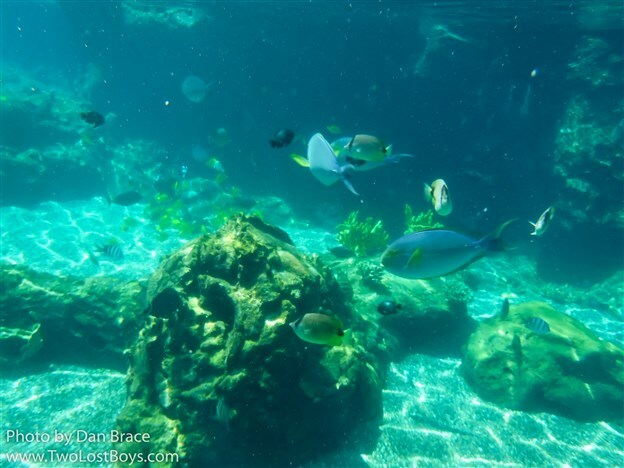 I took with us our underwater camera, and while the photos aren't great, I hope they give some sense of how cool Rainbow Reef is. 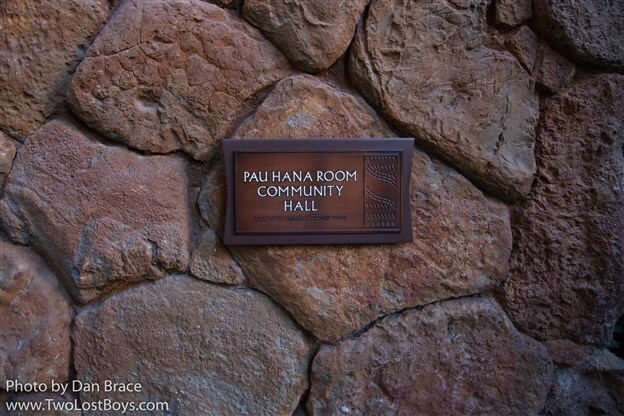 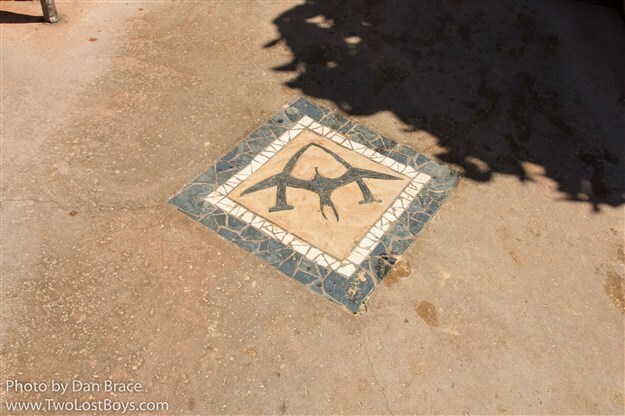 On the ground floor, just off of the valley, at the bottom of the eastern tower, there is a room called the Pau Hana Community Hall. 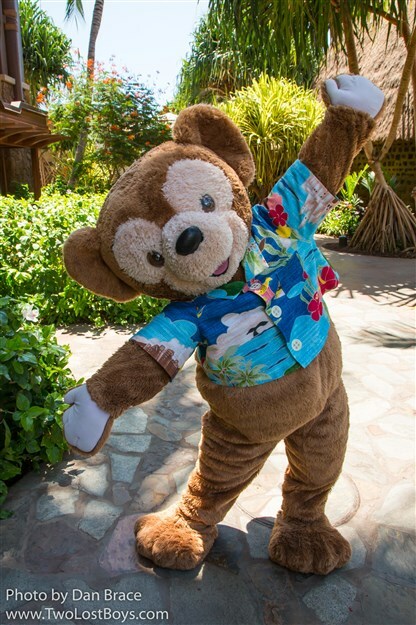 Here you can participate in special activities organised by the entertainment team, relax, watch movies, and sometimes even meet characters. 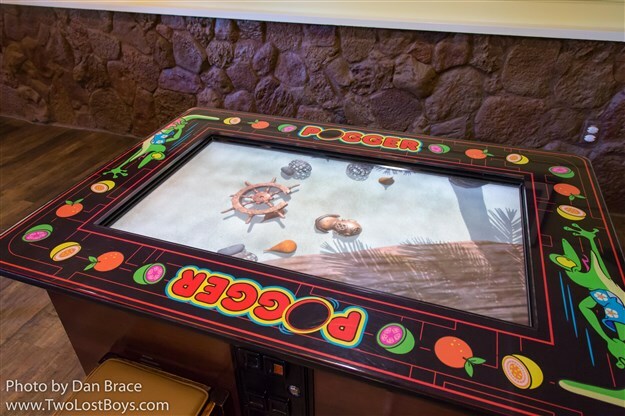 It is also where you can pick up interactive devices to play the various trail games that are weaved throughout the resort. 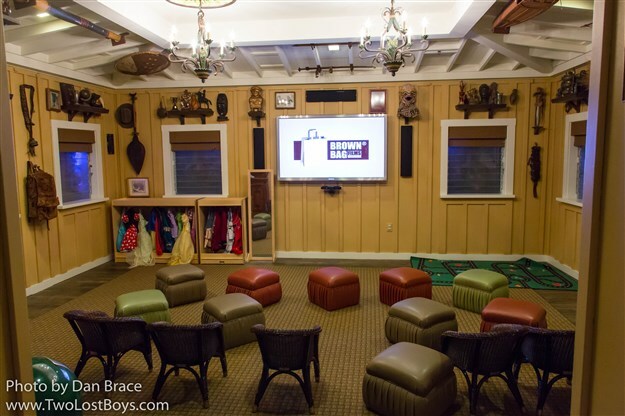 Unfortunately, during our visit, the system was down for both games. 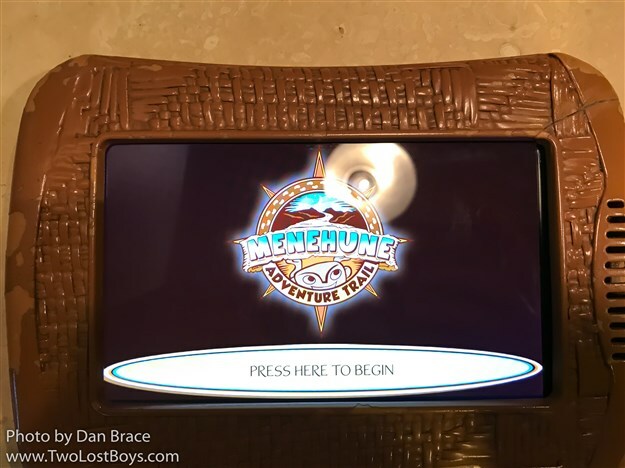 We got to see one of the devices started up though, and it looked like a lot of fun, but we never got to complete it, sadly. 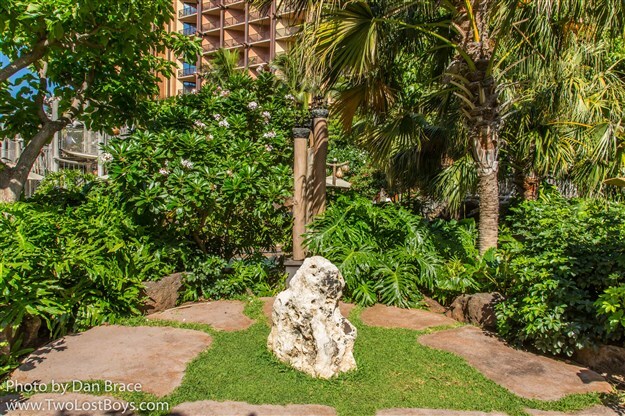 Just along the pathway from the Pau Hana room, and under the same tower is Aunty's Beach House. 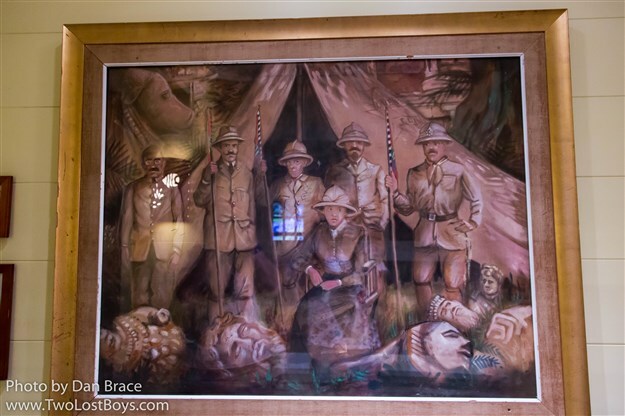 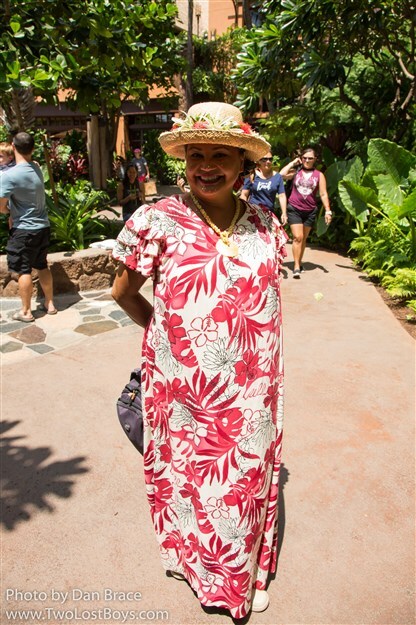 In part one I mentioned the aunty and uncle storytellers (wise elders) who you can find throughout the resort, and so here we also find a kids' club hosted by the aunties and uncles. 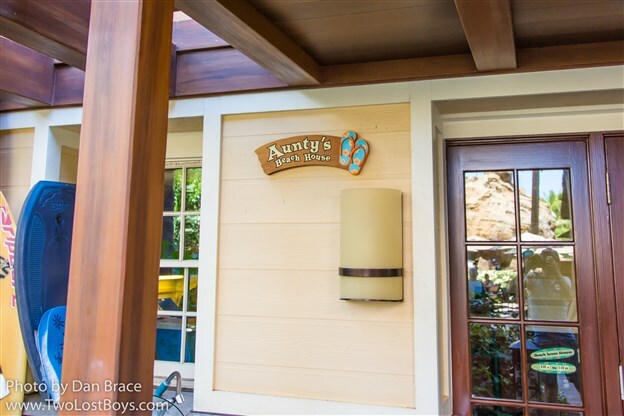 Aunty's Beach House and all the activities therein are for exclusive use of young children, however, early in the morning before the club officially opens the aunties hold an open house where any guest can wander through and explore. 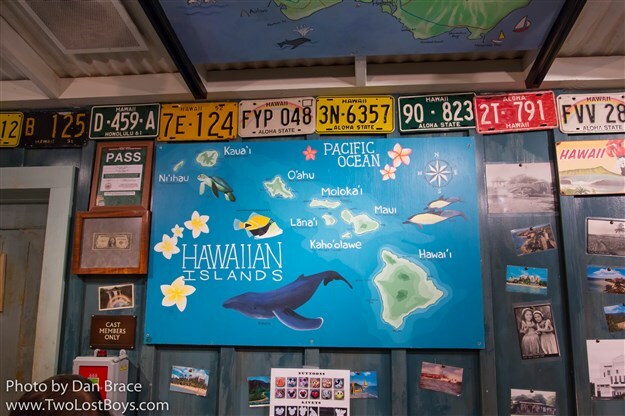 Never being ones to miss an opportunity, we had to go look inside! 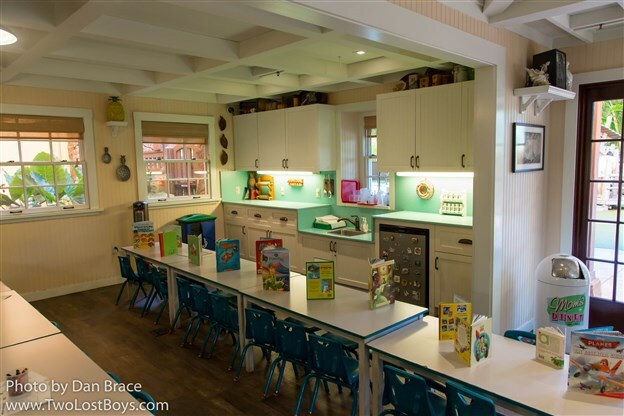 I have to admit, I really wish I had anything remotely this cool when I was a kid! 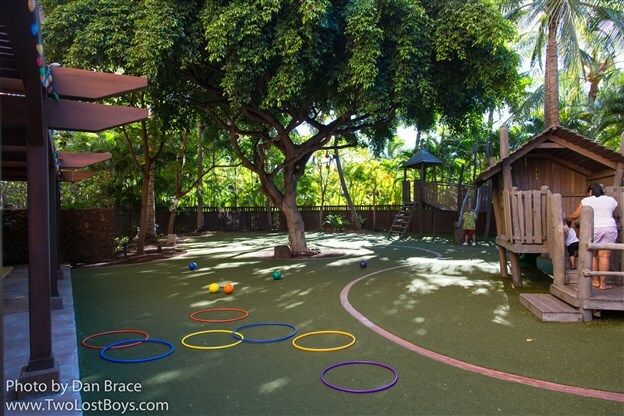 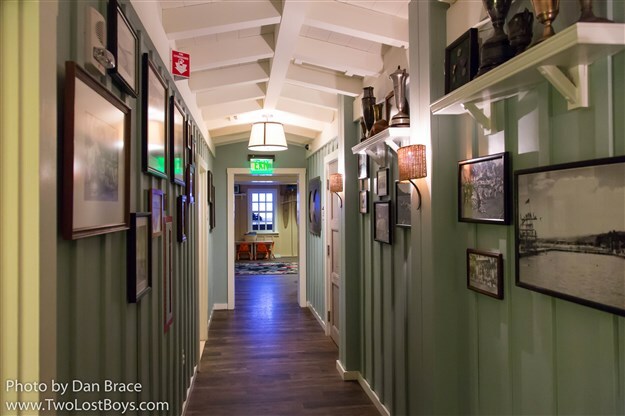 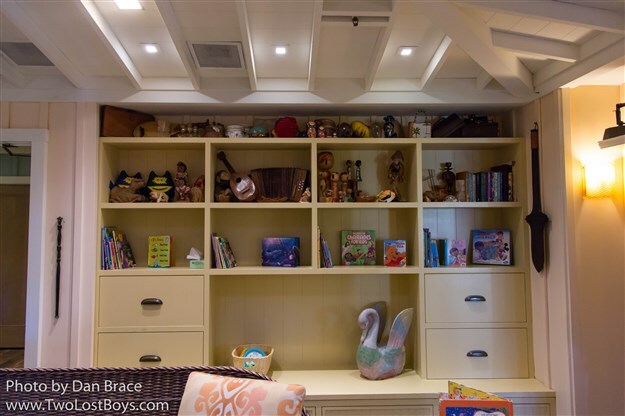 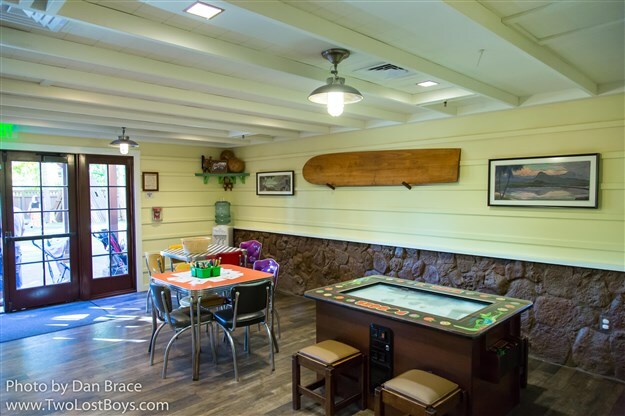 There are interactive areas, lots of games, relaxing areas, different themed rooms, outdoor play areas, and more. 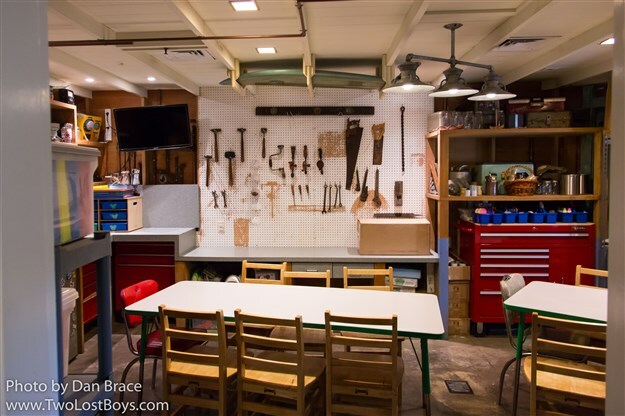 It looks a ton of fun, and I am sure that kids absolutely love it - I loved the open house and I'm 32! 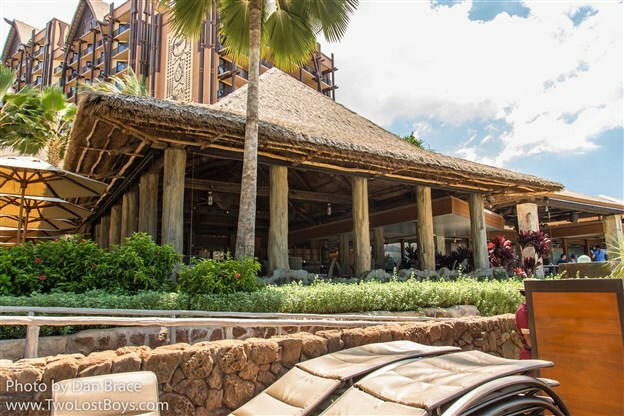 Back to the pool area, and there are several dining locations and a small retail location located right at the heart of all the fun. 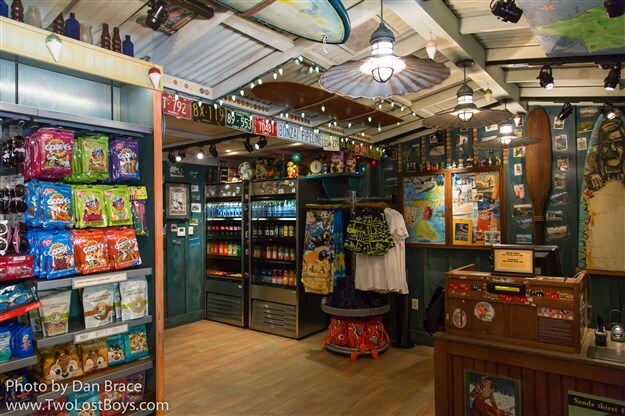 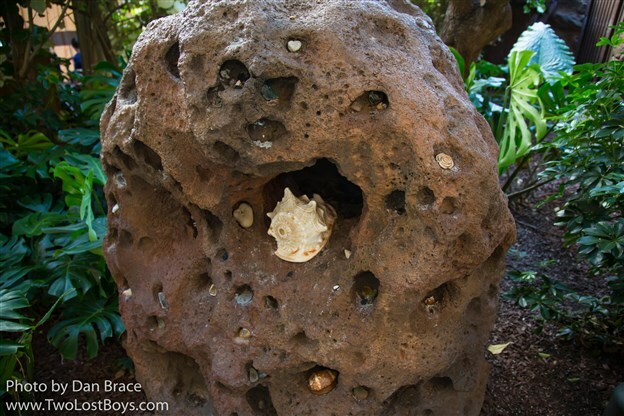 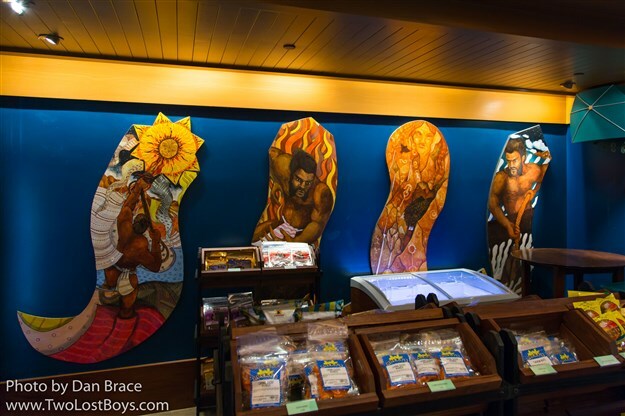 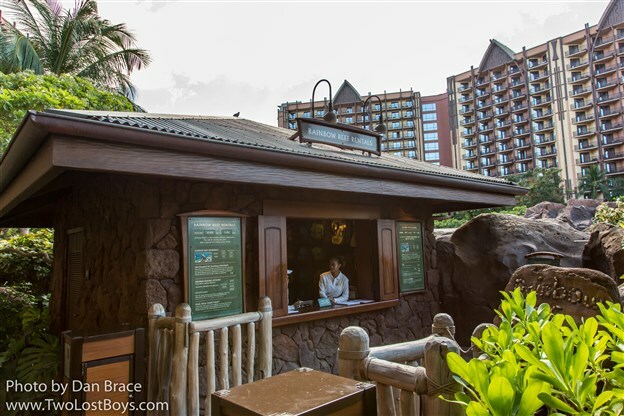 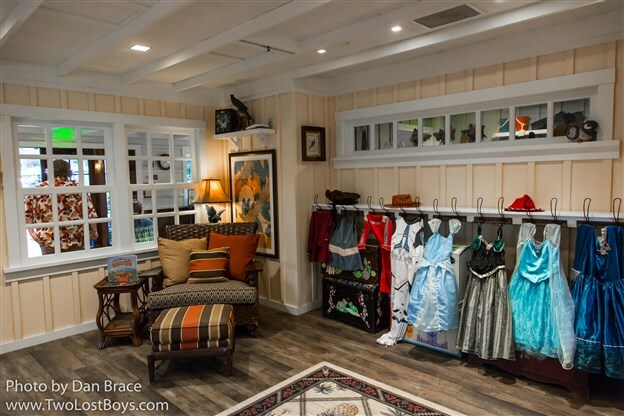 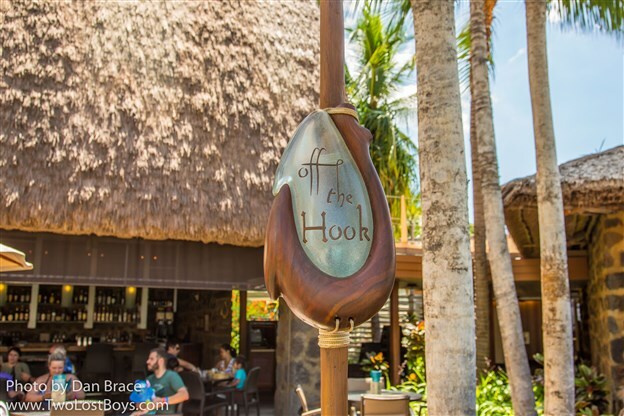 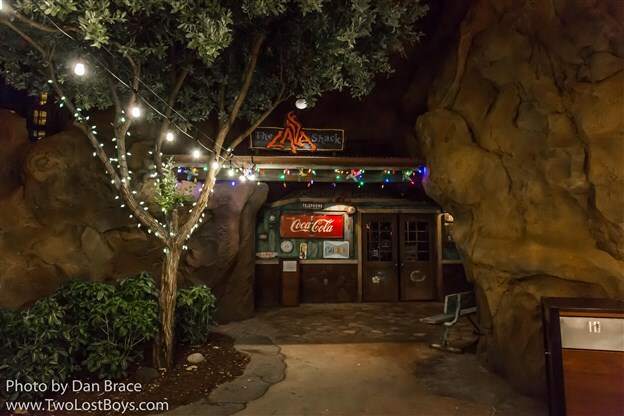 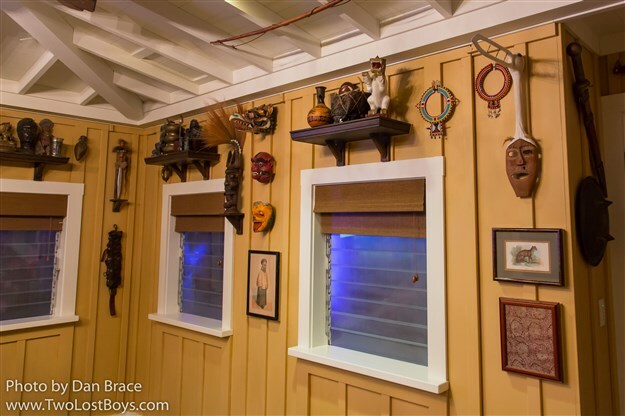 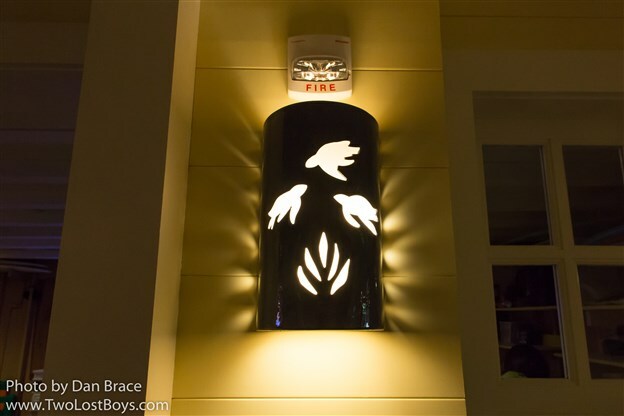 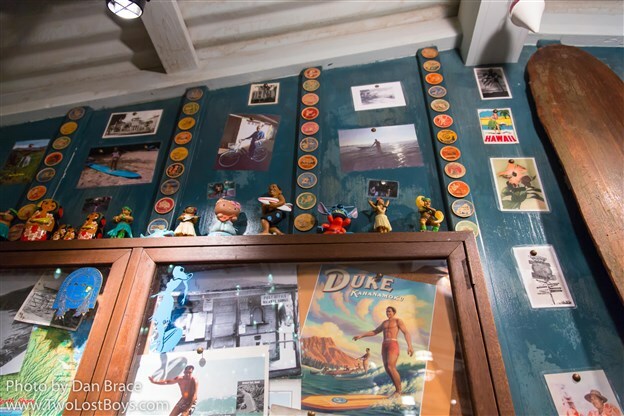 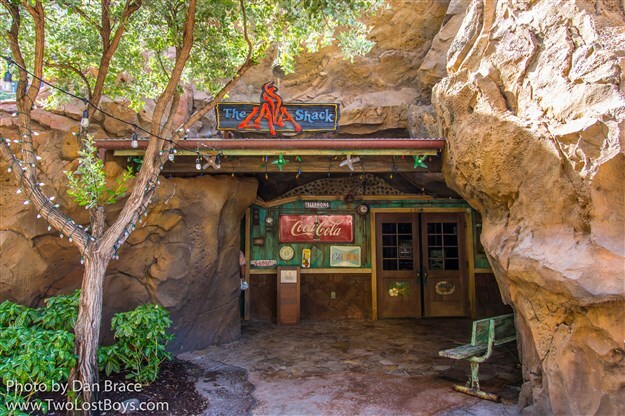 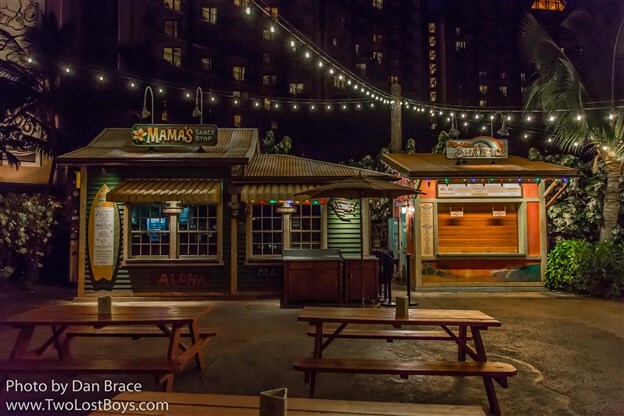 The Lava Shack is a small store where you can buy beachwear and pool essentials, as well as one of the locations where you can purchase - and refill - the Aulani refillable mugs. 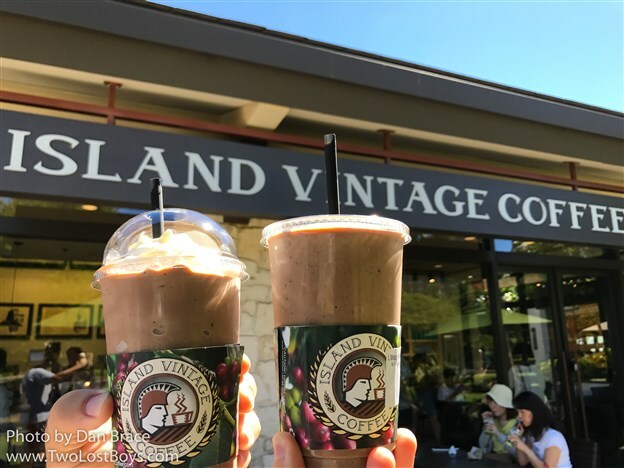 They actually are a pretty good deal. 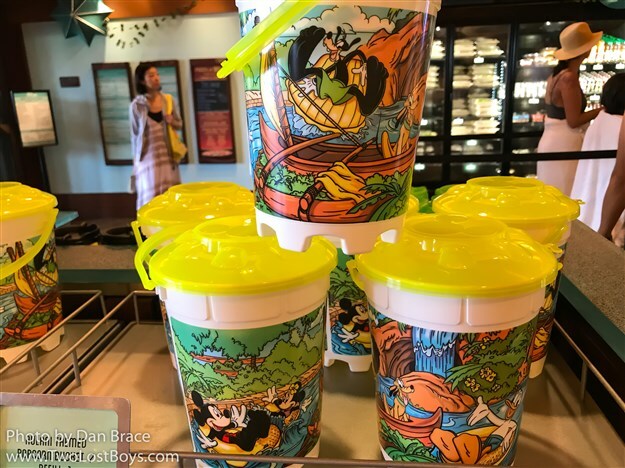 For $18 you get to use the mug for the length of your stay at several refill stations across the resort, for both hot and cold drinks. 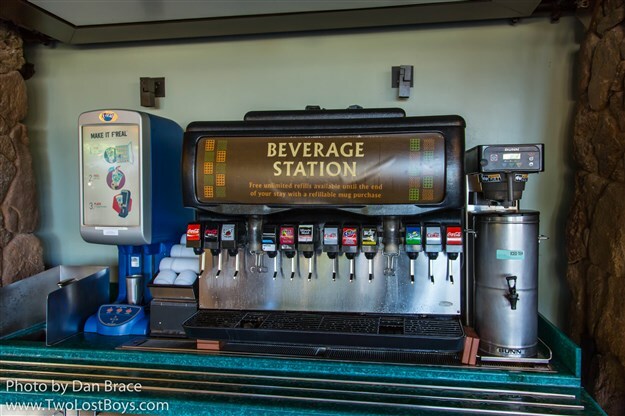 Beats paying $4+ per drink, that's for sure! 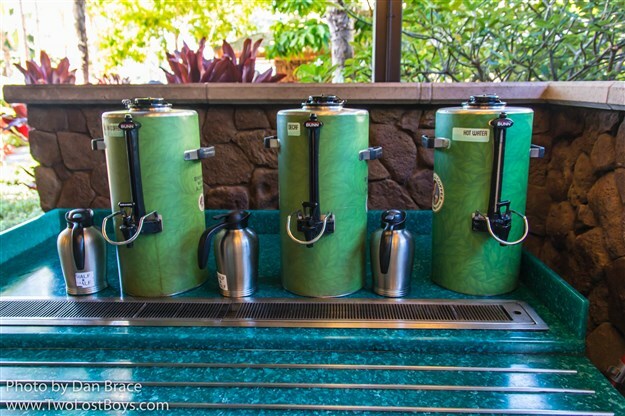 As far as we know, only the refill station near the 'AMA 'AMA table service restaurant operates 24 hours. 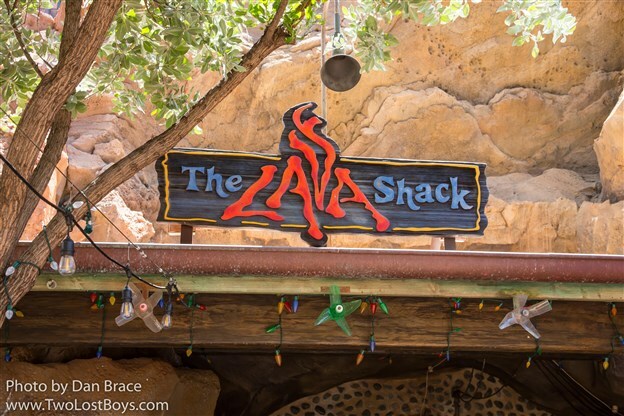 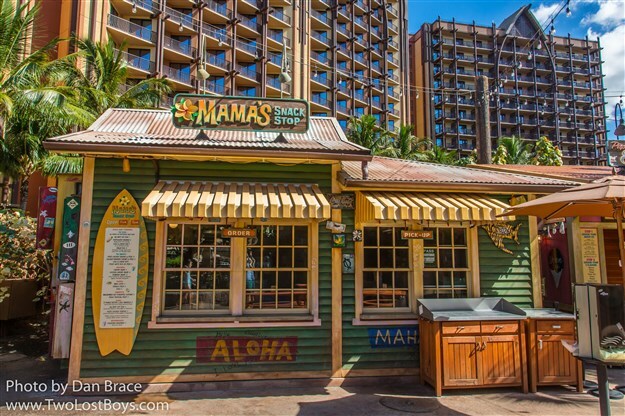 Opposite the Lava Shack is Mama's Snack Stop, where you can get quick bites such as hot dogs and chicken tenders. 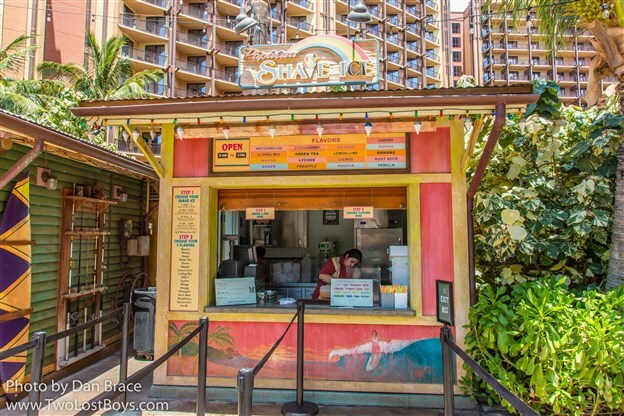 Next to that is Papalua Shave Ice, where, unsurprisingly, you can get shaved ice treats. 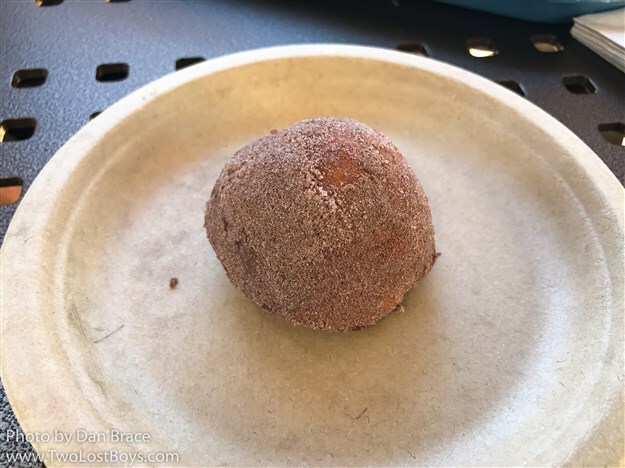 We tried some, and we were not disappointed! 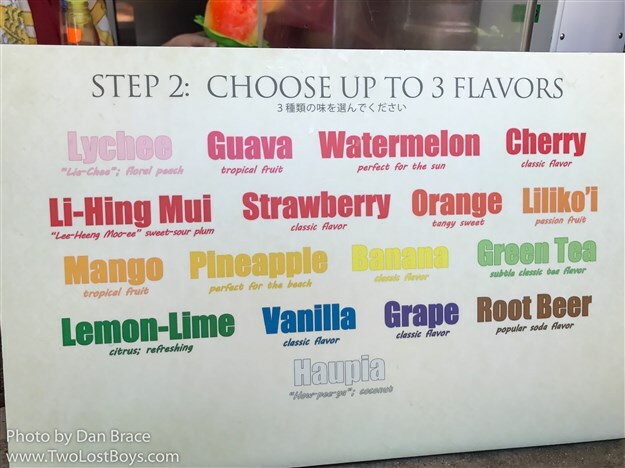 You can mix up to three flavours, and add ice cream to the bottom. 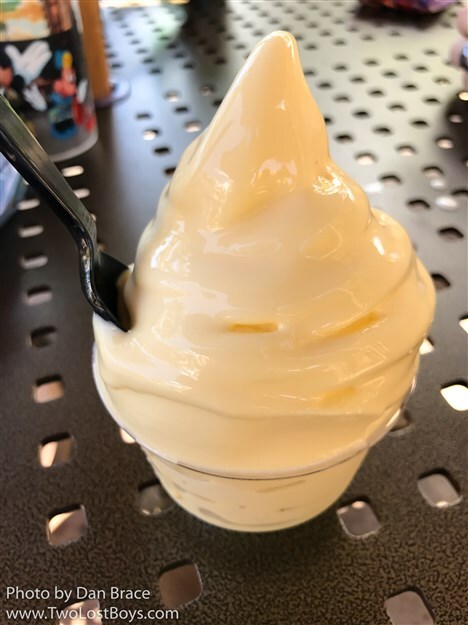 They put condensed milk on the top, which, while sounds odd, once it has fused with the frozen flavours, creates a mix that I can only describe as extremely satisfying! 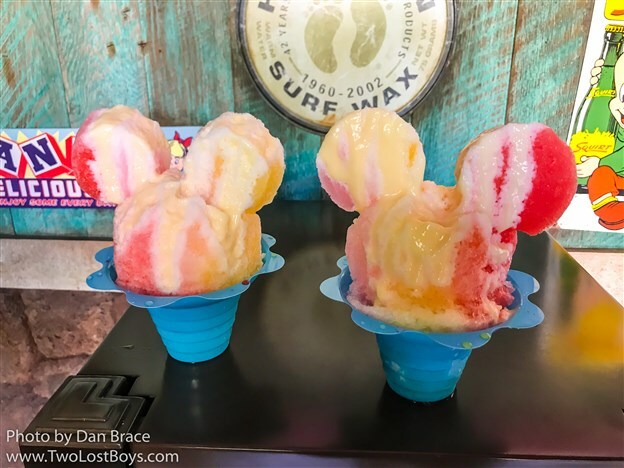 The shaved ice even comes shaped like Mickey's head! 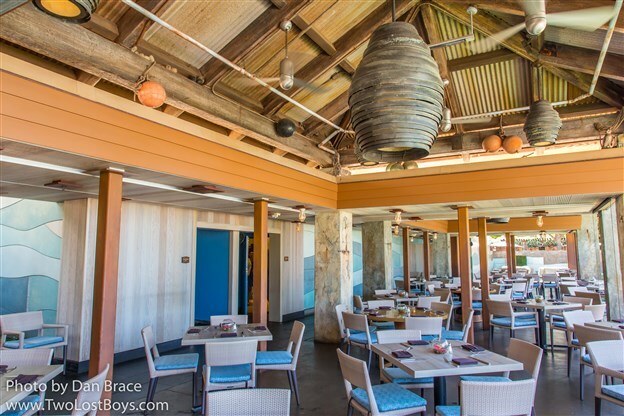 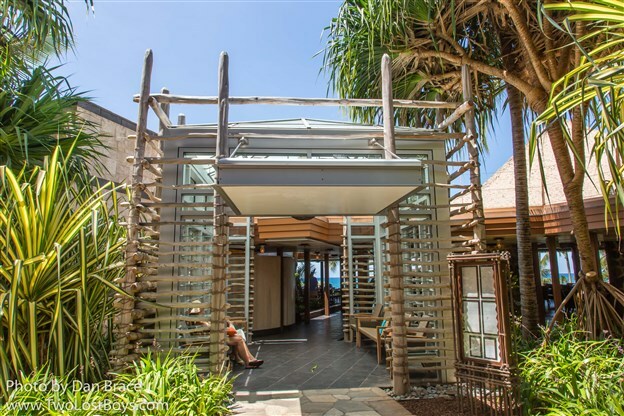 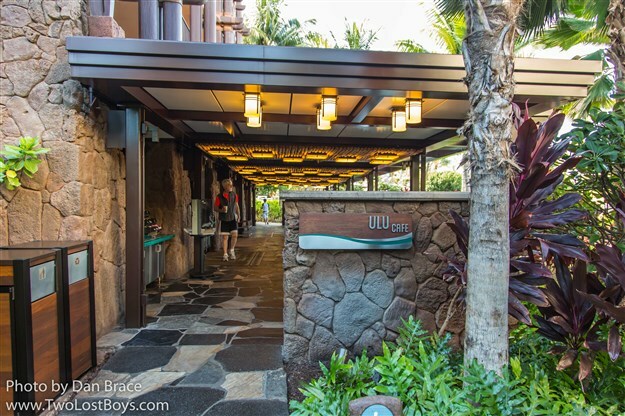 The Ulu Cafe, under the western tower, is almost certainly the core casual dining location at the resort, offering a wide selection of breakfast, lunch and dinner options in a very low key outdoor environment. 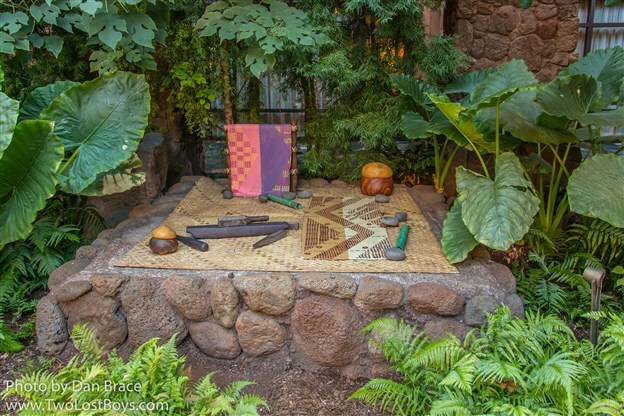 It's pleasant enough and a good place to start the day if you're not attending the character breakfast. 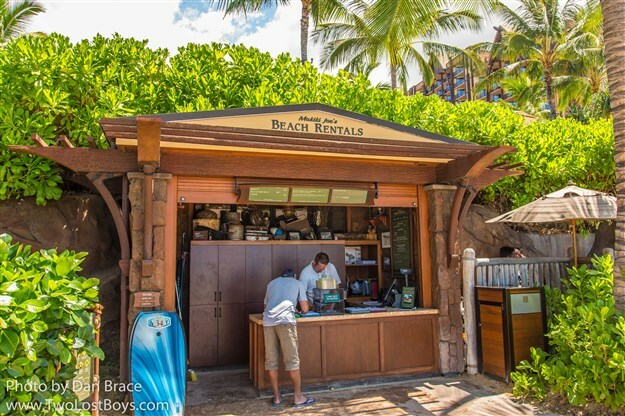 You can also buy here Aulani exclusive popcorn buckets. 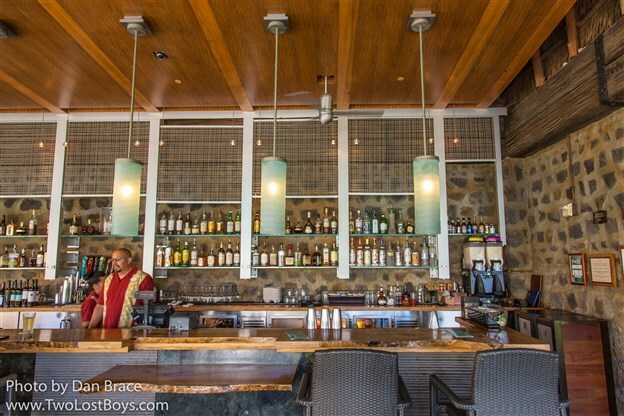 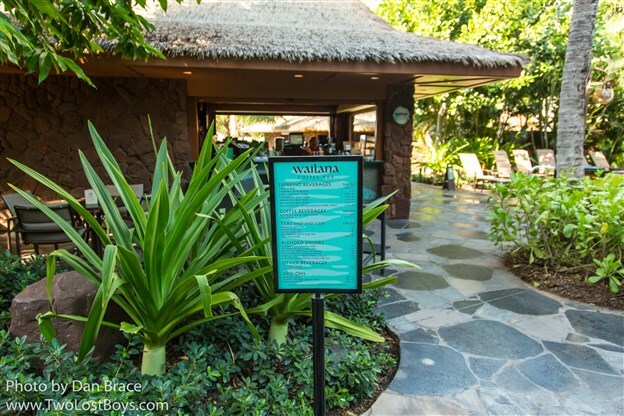 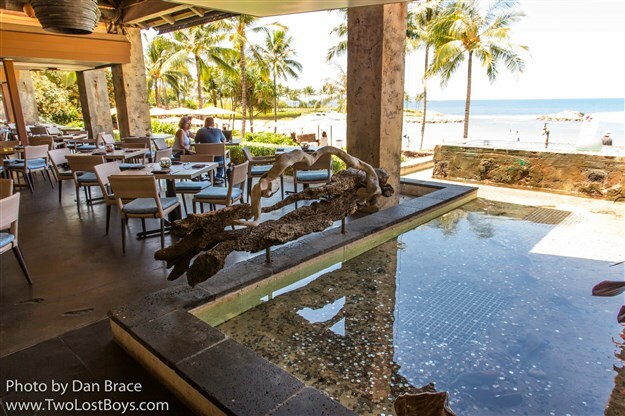 Very close to Ulu Cafe is the Wailana adult pool bar, which offers tea, coffee, blended drinks and a few other options. 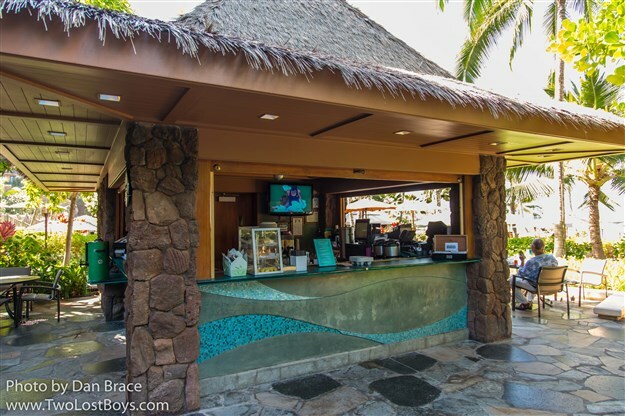 On the opposite side of the pool from Wailana and Ulu Cafe is Off the Hook - a pool side table service bar. 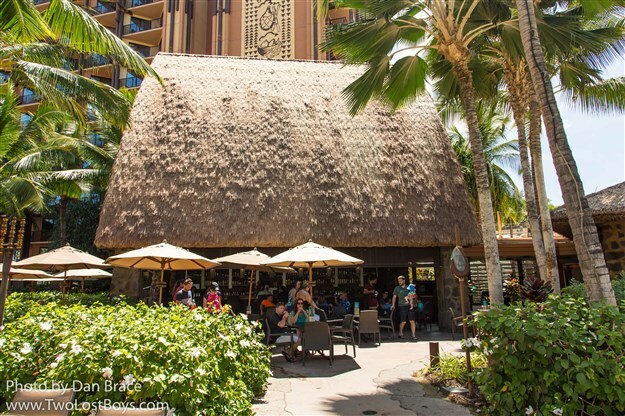 We ate lunch here one day and got a special cocktail in a pineapple, and while it was all very nice, it was extremely expensive for what it was. 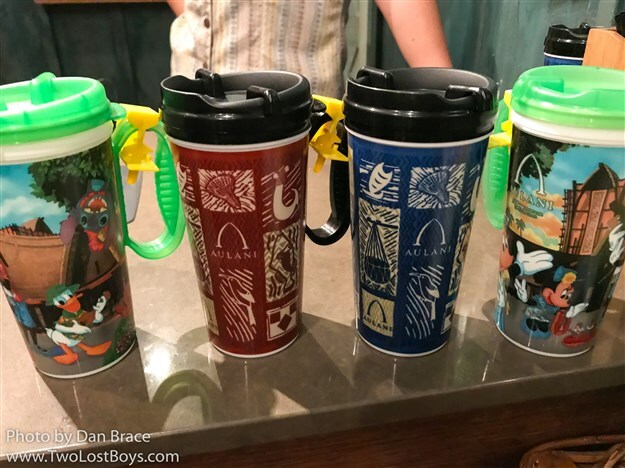 For what we got for the price, we preferred to stick to getting free refills with our mugs and grabbing something at Ulu Cafe, quite honestly. 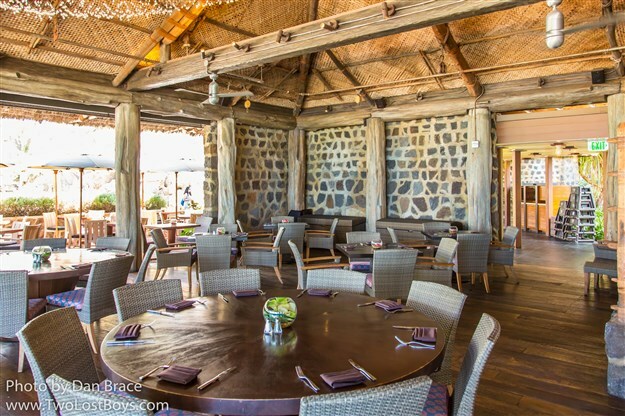 Next door to Off the Hook, facing the beach, is 'AMA 'AMA, the resort's signature table service dining location. 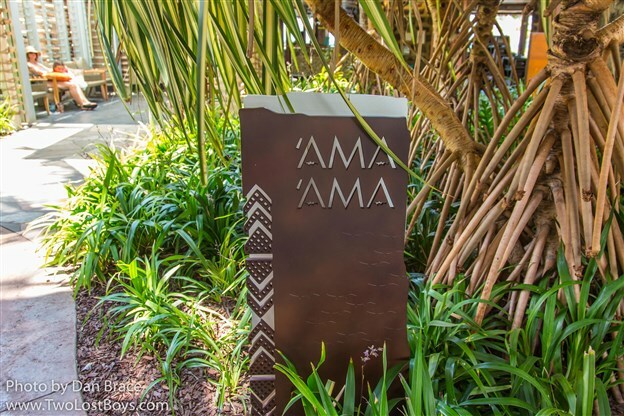 Having already eaten twice at the buffet, several times at Ulu Cafe, and eating once at Off the Hook, we simply didn't have the opportunity to try 'AMA 'AMA, but I of course did take a lot of photos! 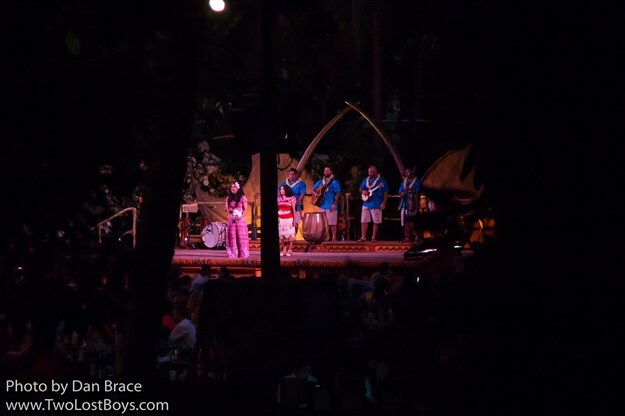 In the evenings while we were there there was a band playing. 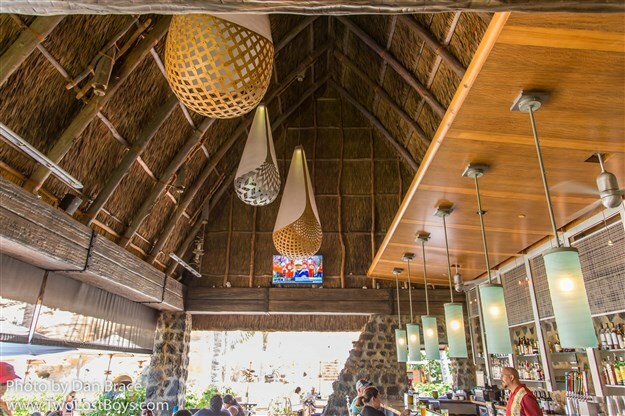 I mentioned above that 'AMA 'AMA is right on the beach, so we shall make that our next stop! 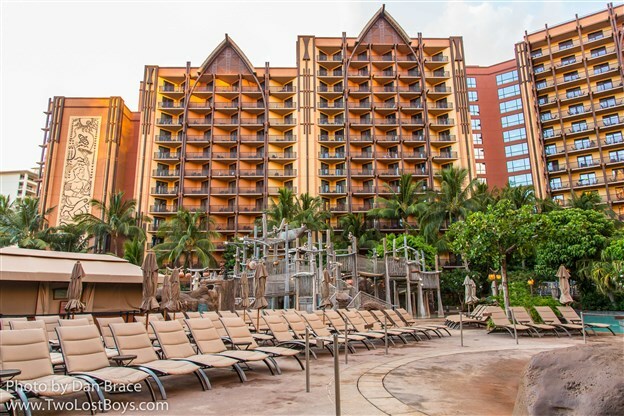 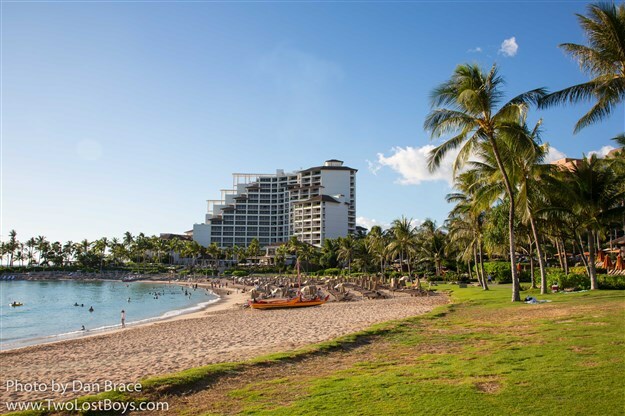 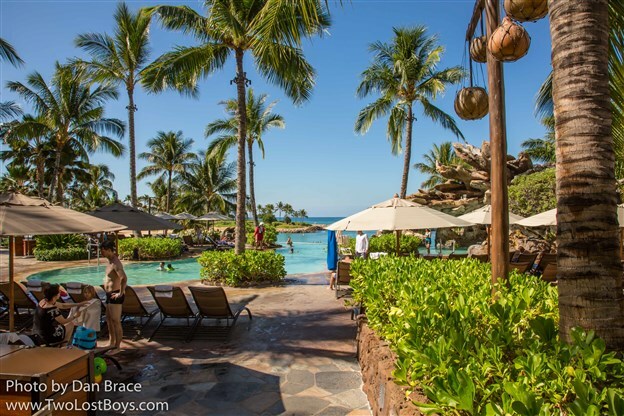 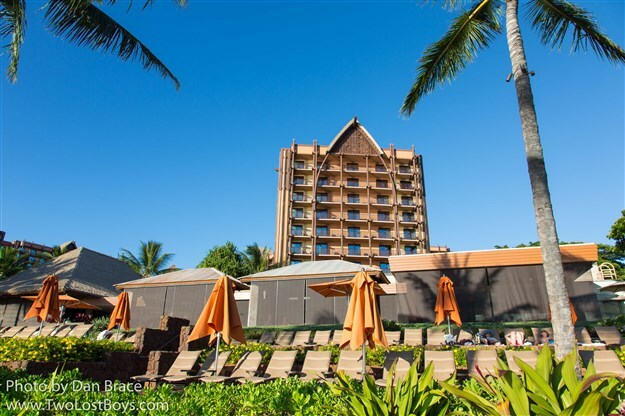 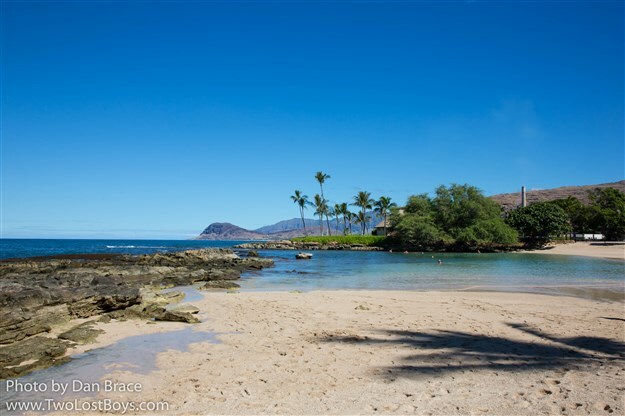 The beach in front of Aulani is a public beach, and is shared with the neighbouring hotel resort next door. 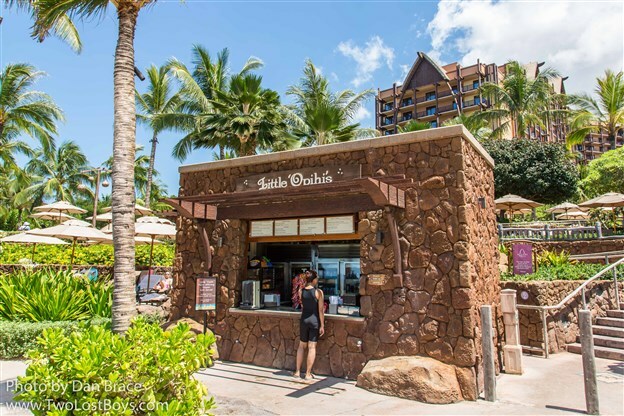 On the beach there are two Aulani operated locations - Makiki Joe's Beach Rentals (no prizes for guessing the purpose of that one), and Little 'Opihi's, which serves salads, snacks, fruit, desserts and drinks. 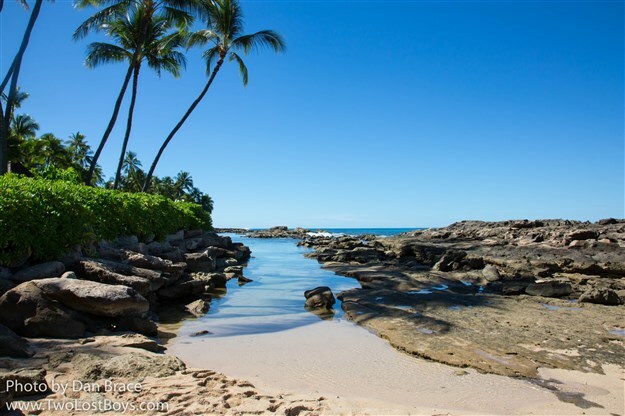 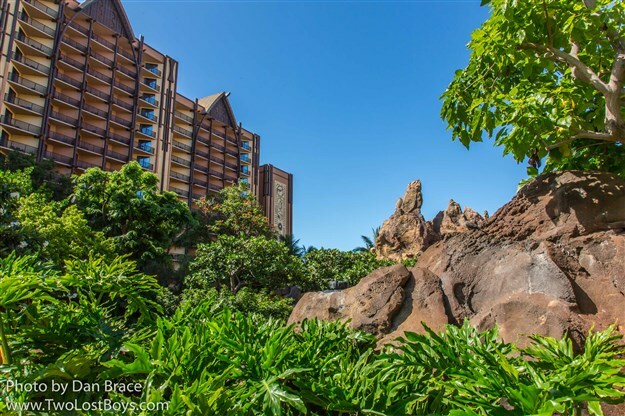 The beach area is pretty nice over all, with a promenade that leads out to an outcrop where you can get some neat views looking back at Aulani. 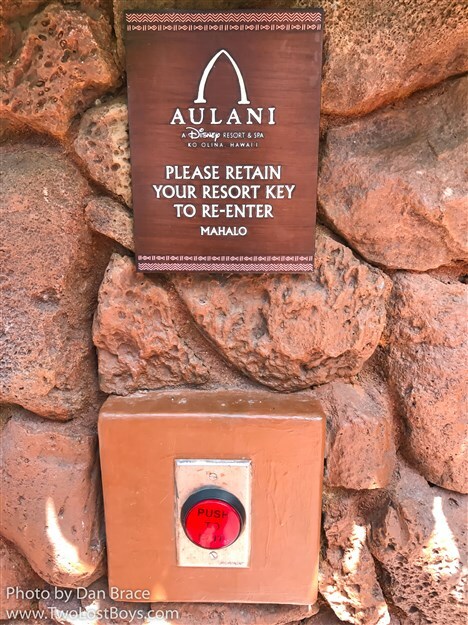 The beach access points from the hotel down to the public area have gates that have keycard touch points, but we didn't see these in use while we were staying at Auani. 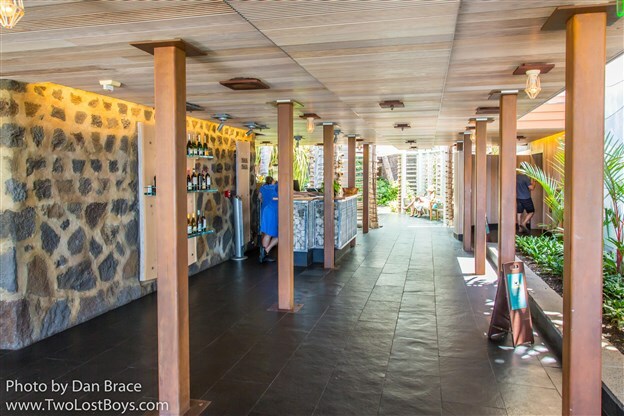 If you don't want to go to the beach itself, there are some lounge chairs on a terrace behind Little 'Opihi's with views towards the beach and ocean. 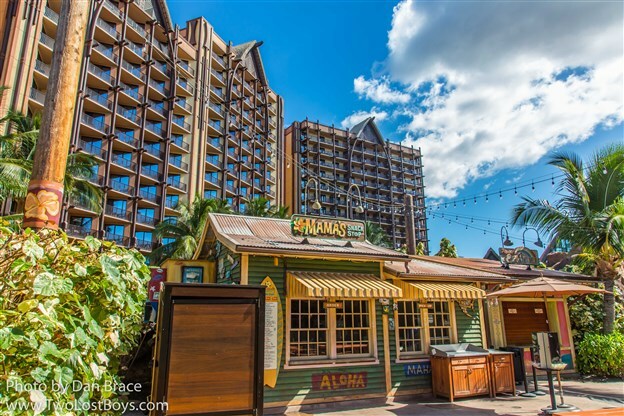 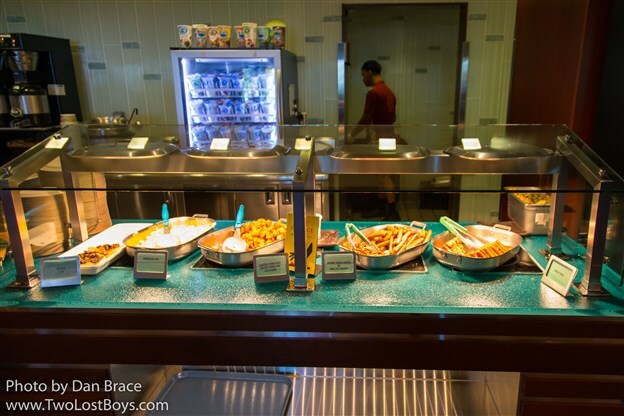 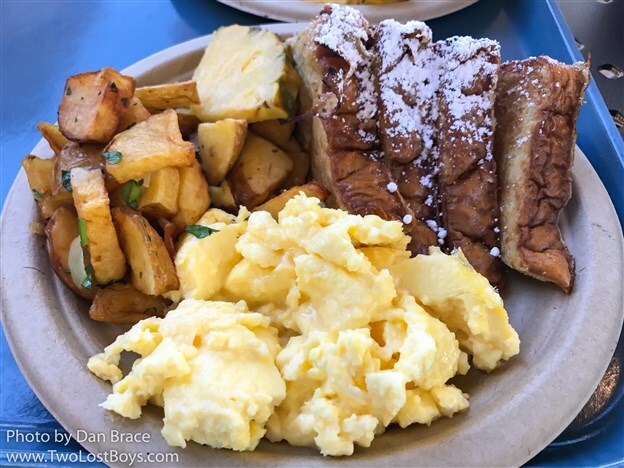 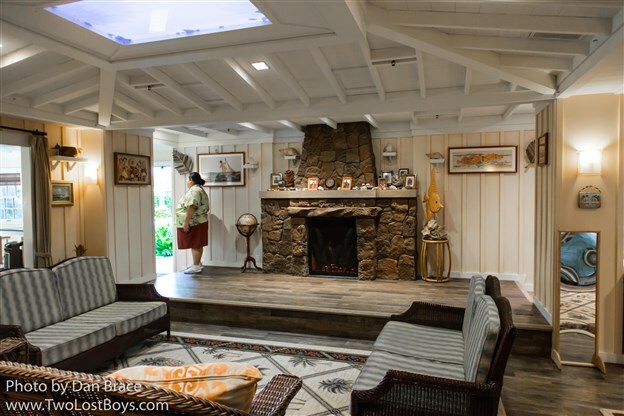 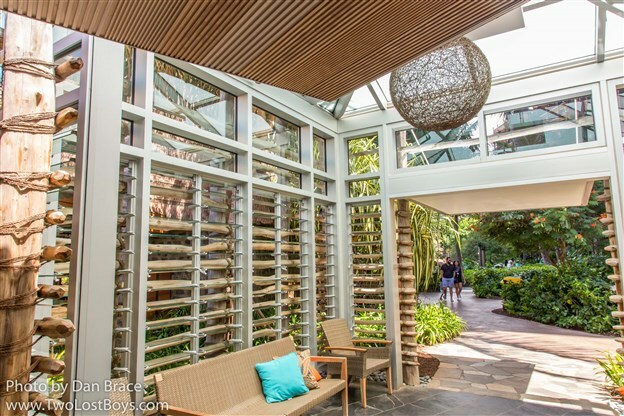 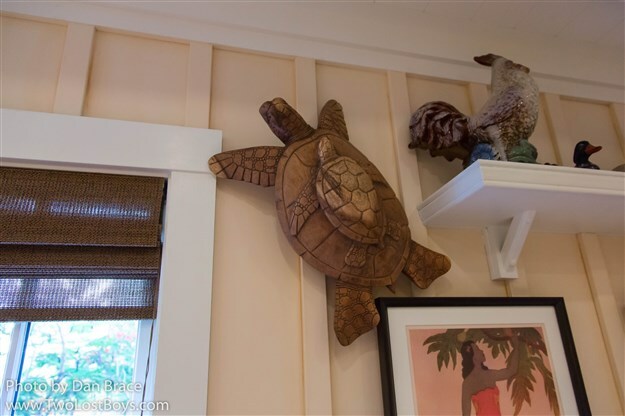 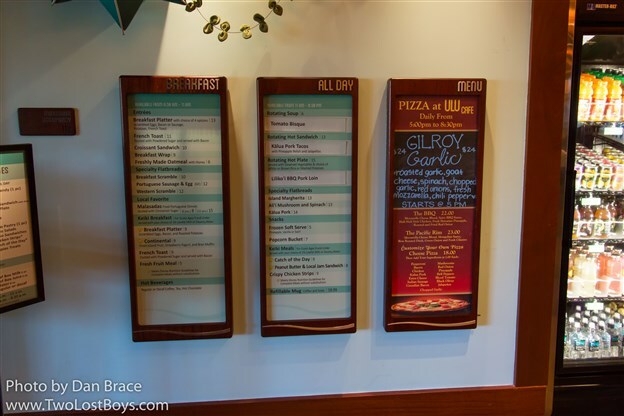 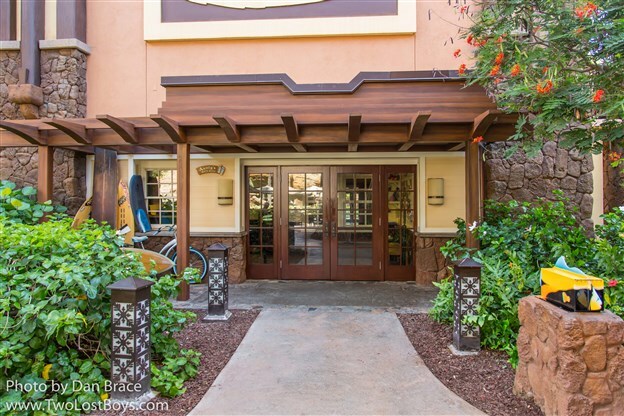 Before we move on to characters and entertainment, I wanted to step outside Aulani and mention the shopping centre down the street, because inevitably, like us, you may want some different, cheaper options during your stay. 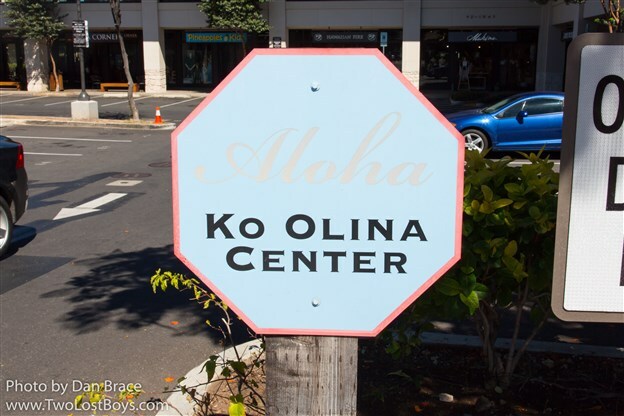 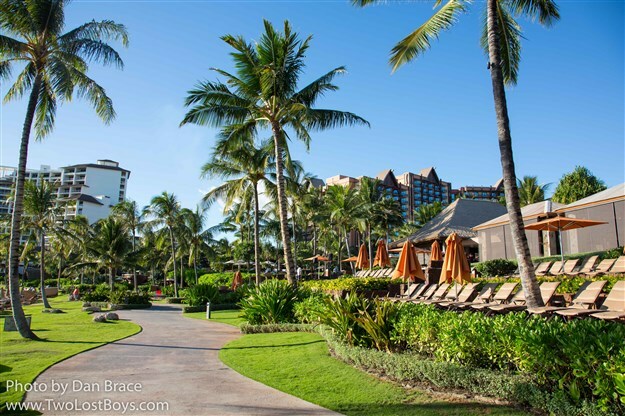 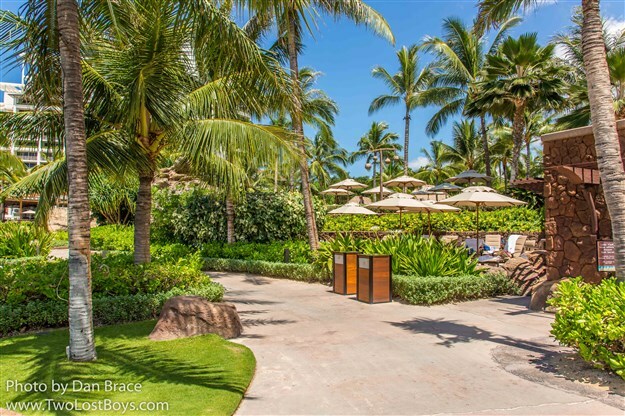 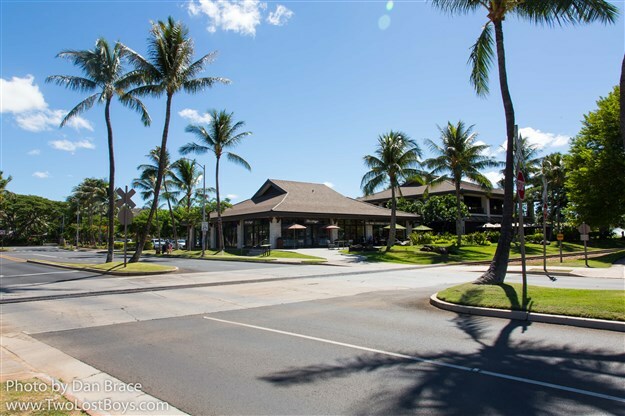 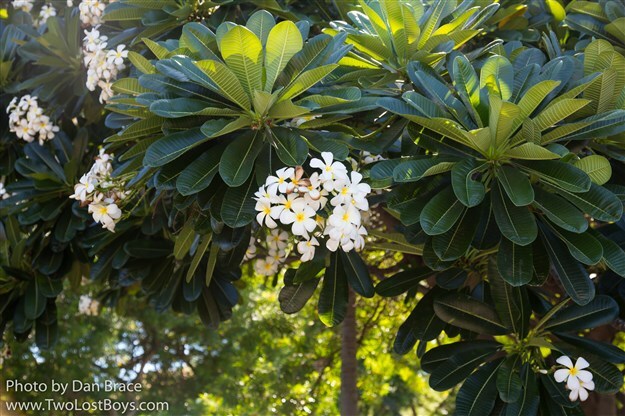 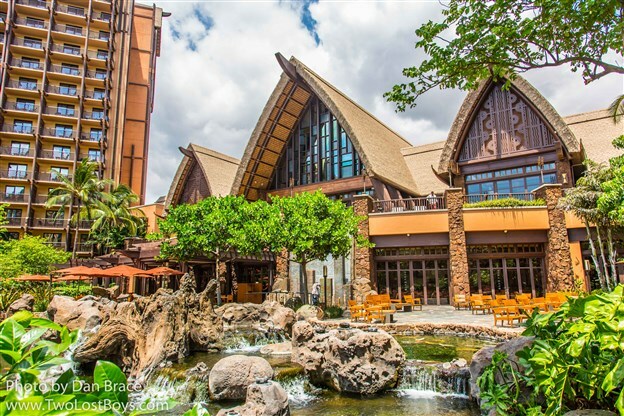 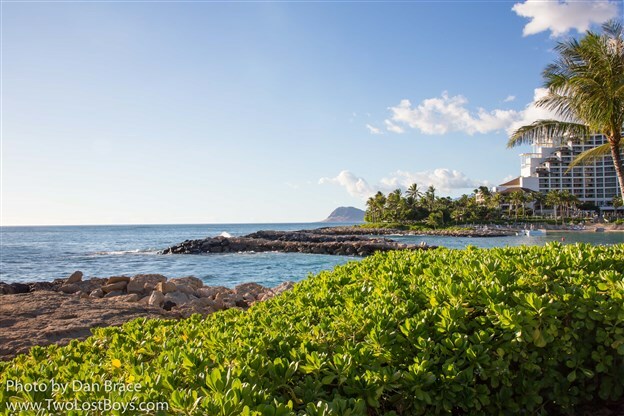 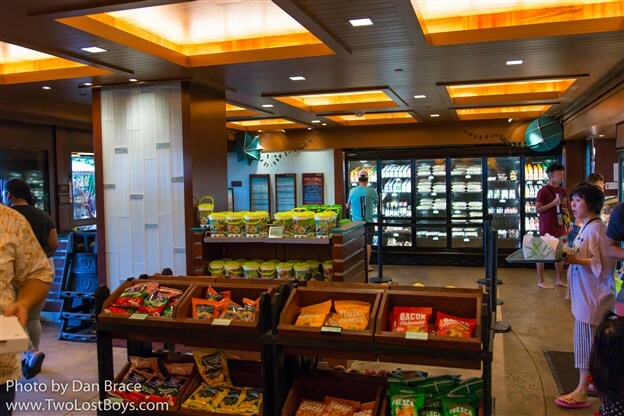 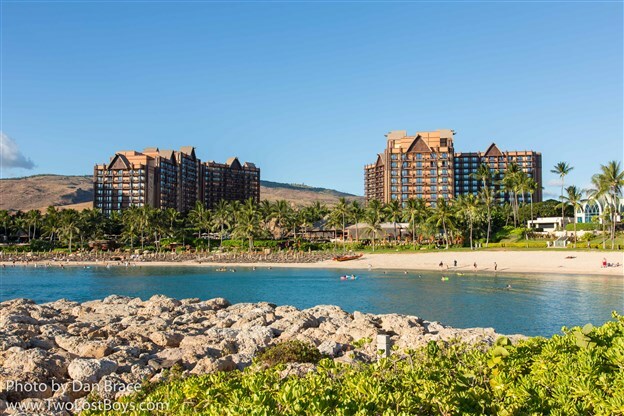 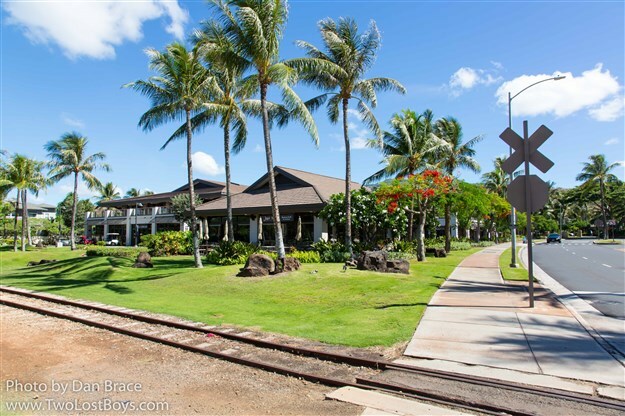 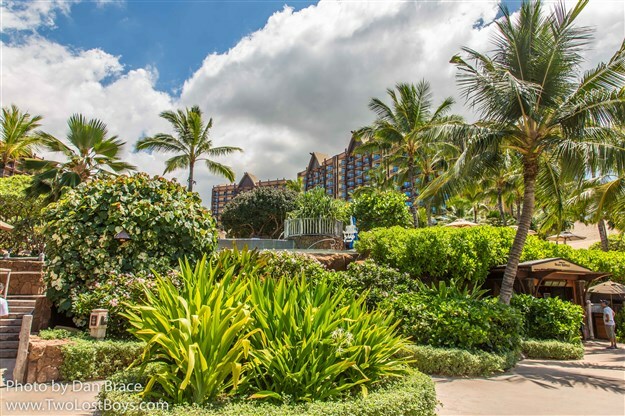 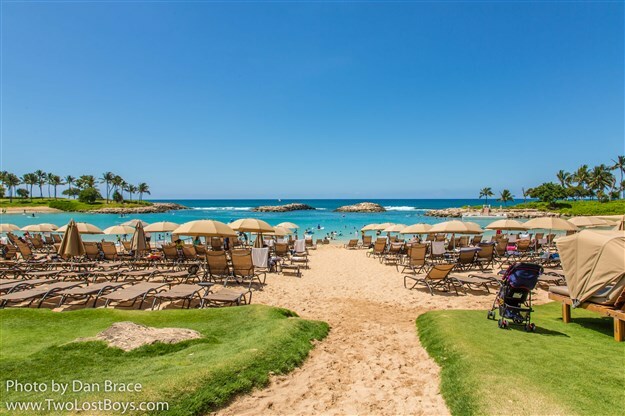 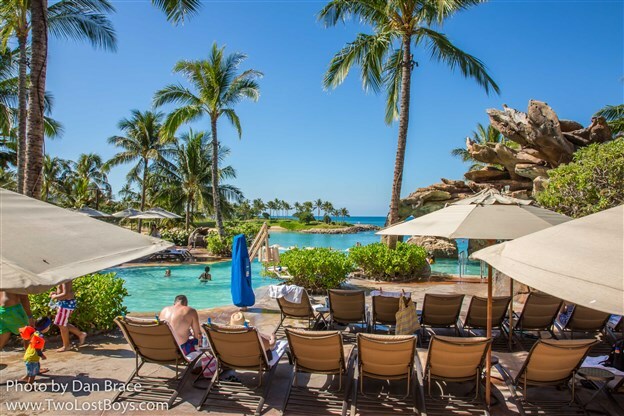 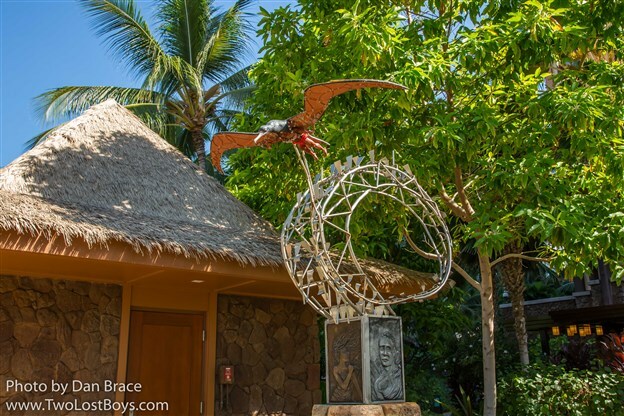 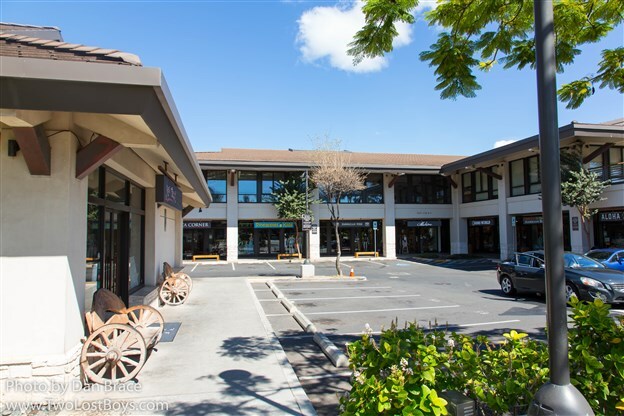 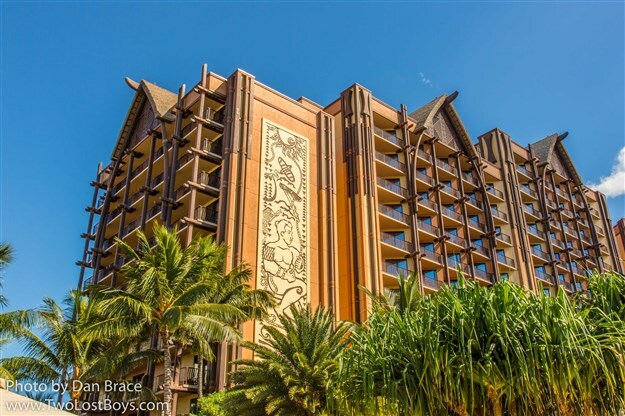 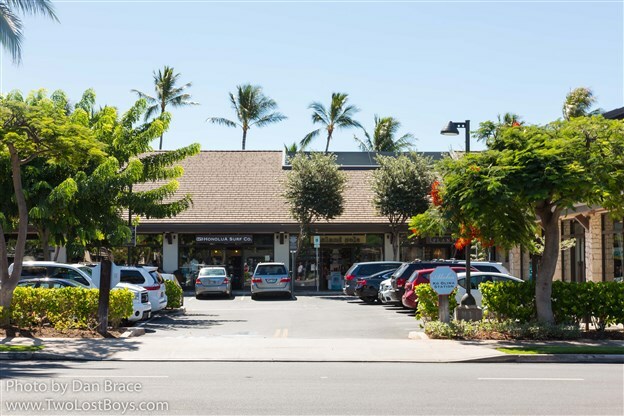 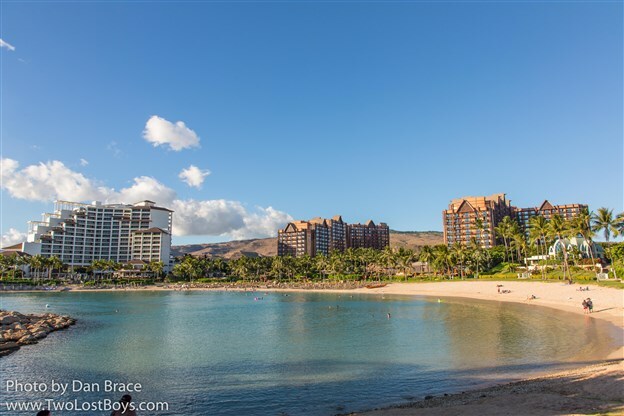 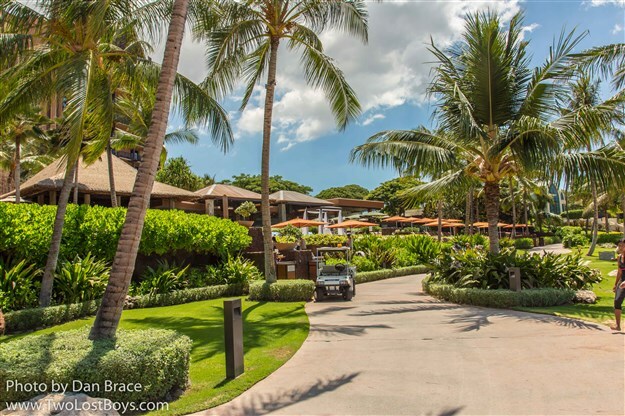 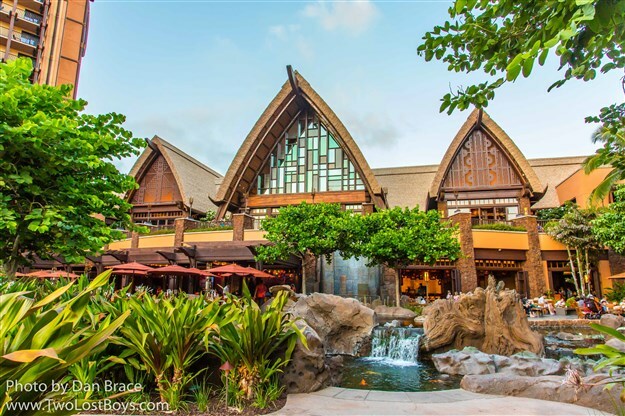 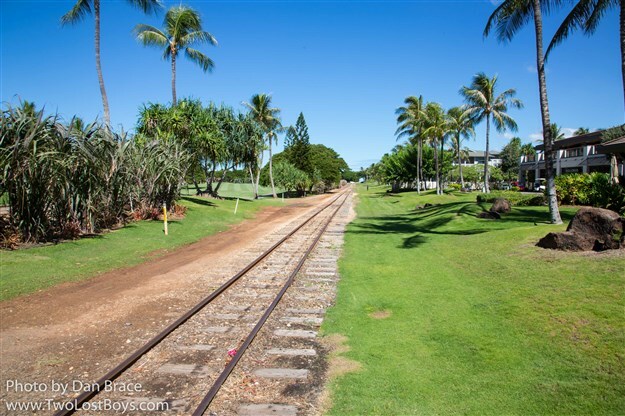 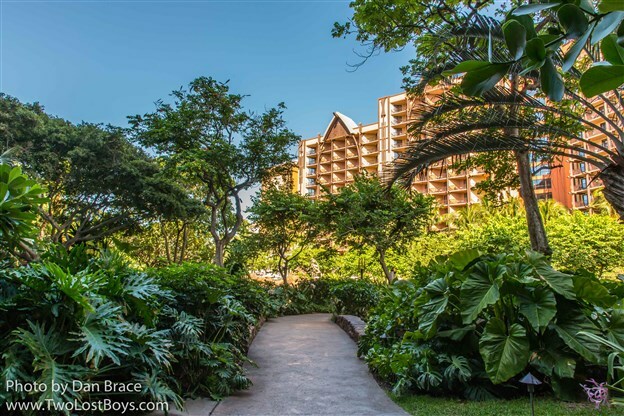 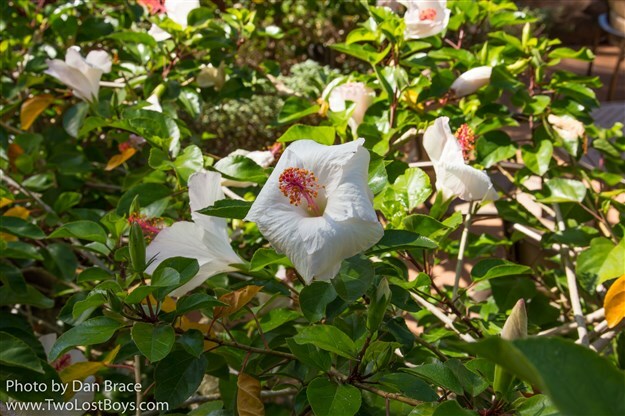 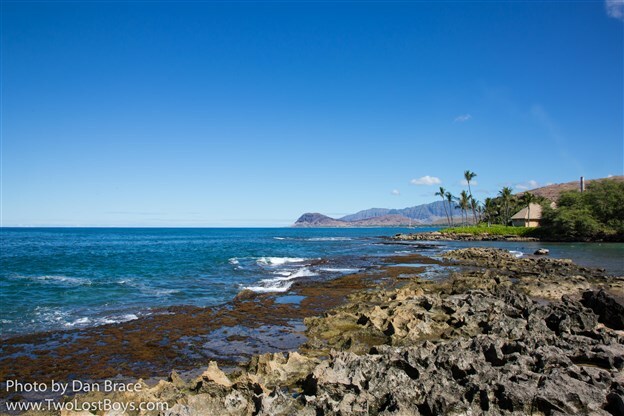 The Ko Olina Center is a small shopping precinct just a couple minutes walk from Aulani (left out of the main lobby) that is home to a few small stores, including a general store/convenience store, a coffee place, a pizza restaurant, and some other retailers. 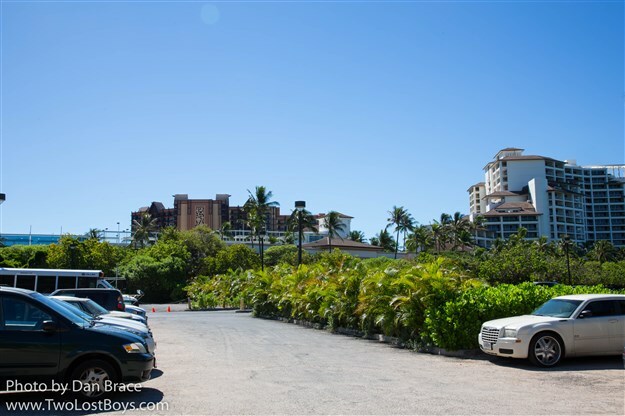 If you walk a little further along the street, on the ocean side, you can access another public beach very easily. 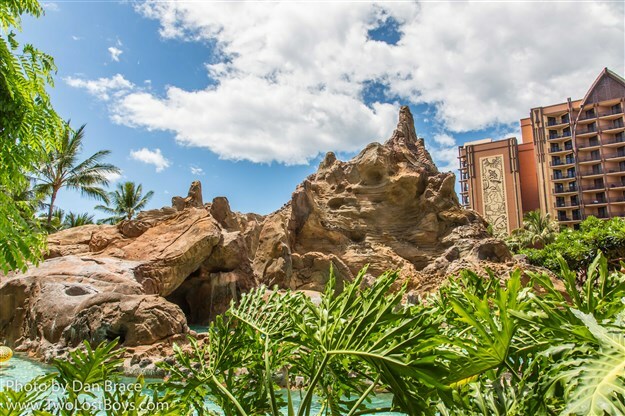 There are some great views here, and it is a little less hectic and decidedly less commercial than the beach at Aulani. 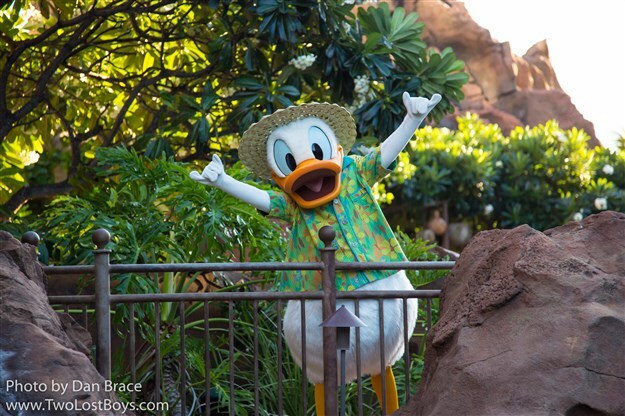 Now we come to the part that I know most of you have been waiting for - character greetings and entertainment! 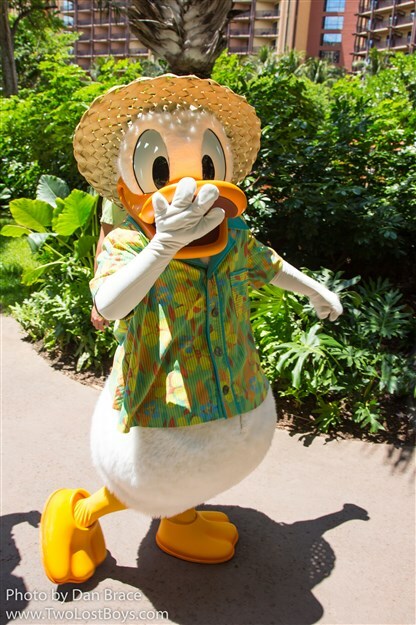 First, the greetings. 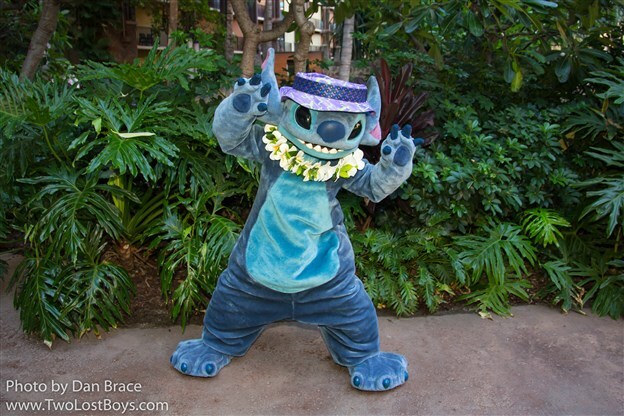 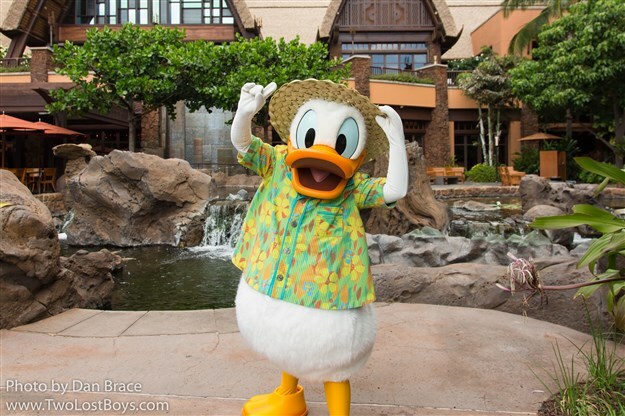 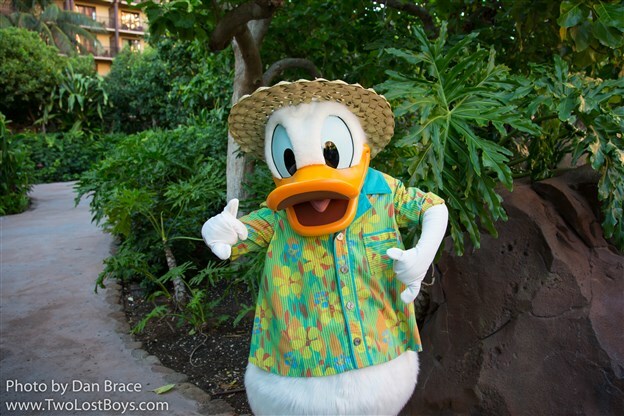 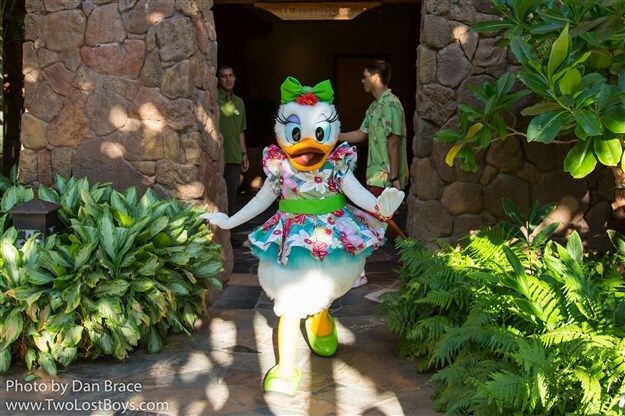 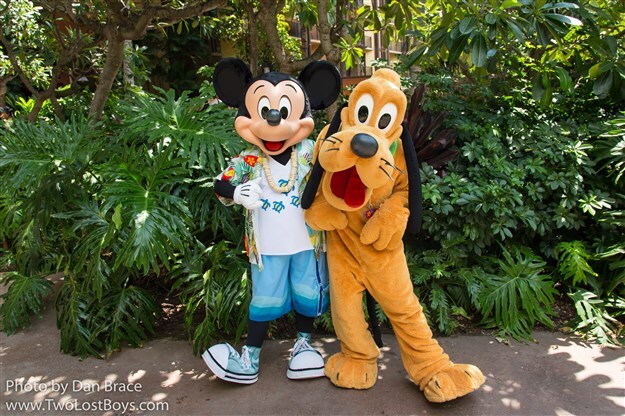 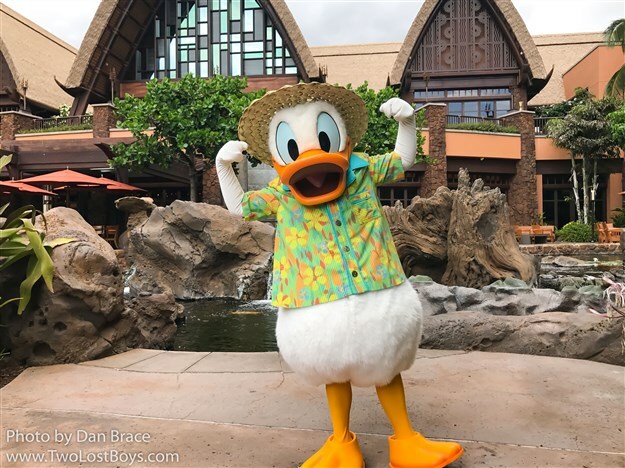 Aulani currently has twelve characters that visit and spend some of their vacation time there. 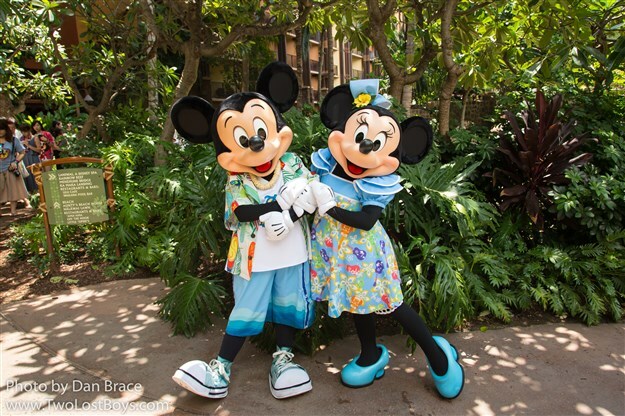 These are: Mickey Mouse, Minnie Mouse, Donald Duck, Daisy Duck, Goofy, Pluto, Chip, Dale, Duffy, ShellieMay, Stitch, and Moana. 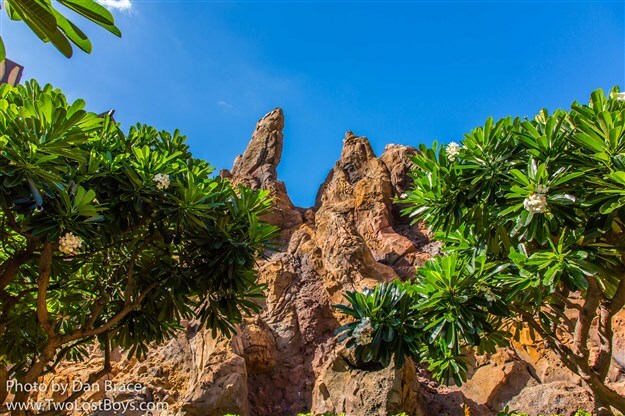 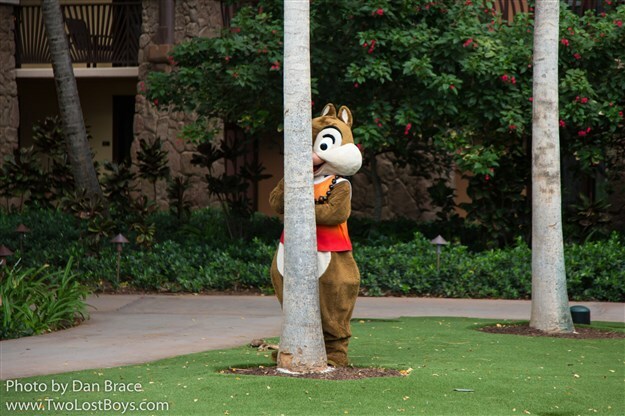 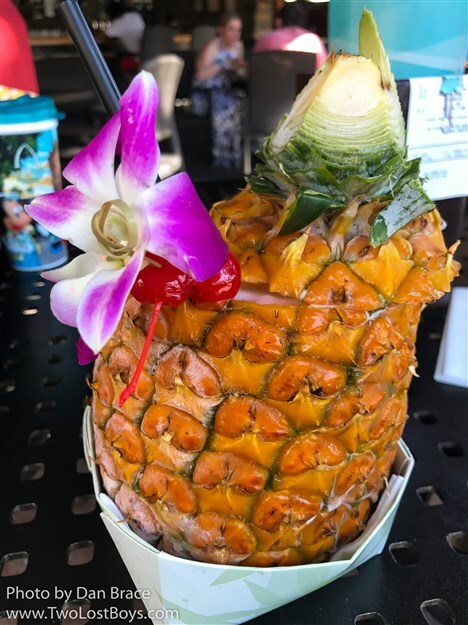 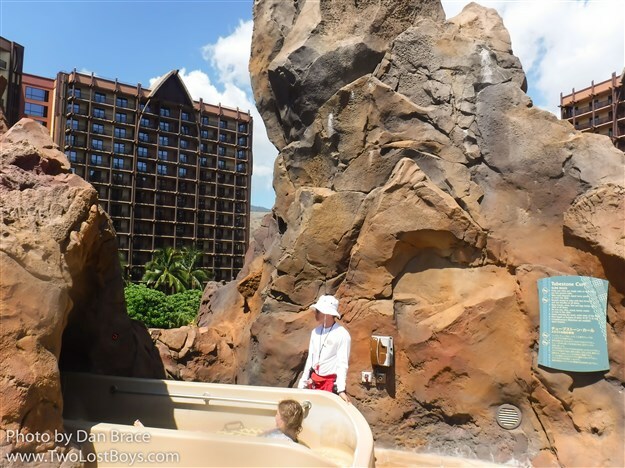 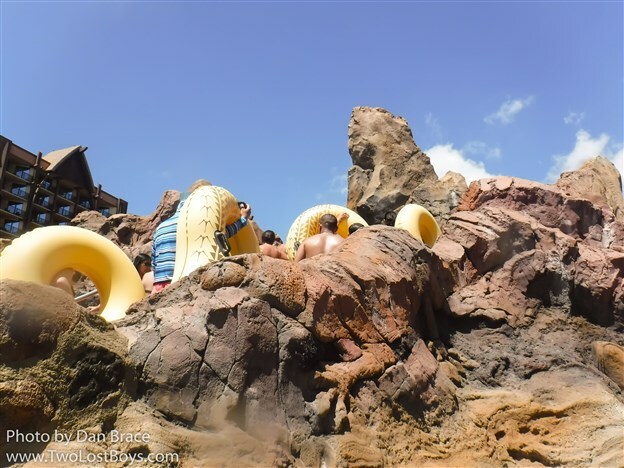 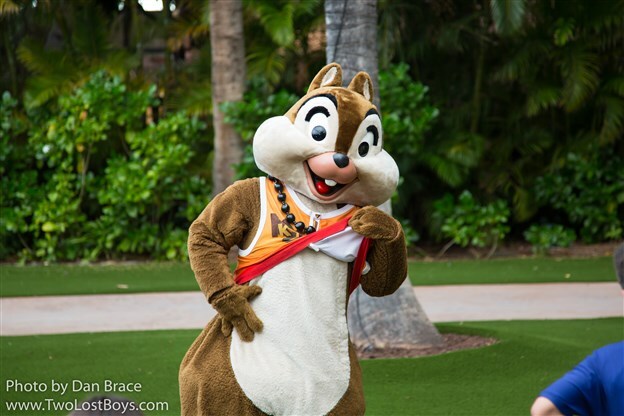 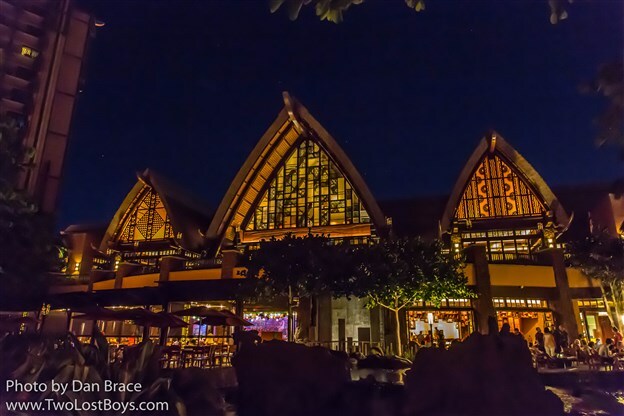 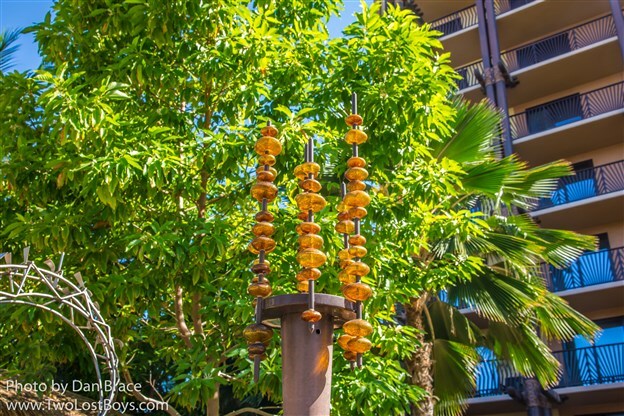 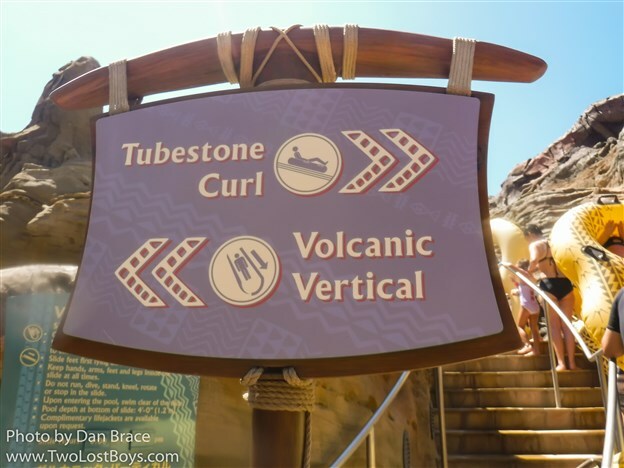 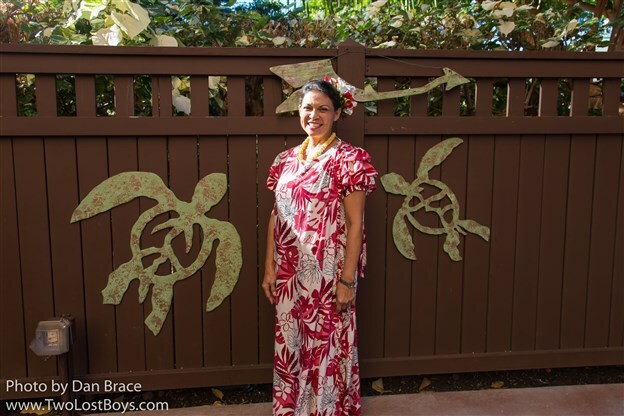 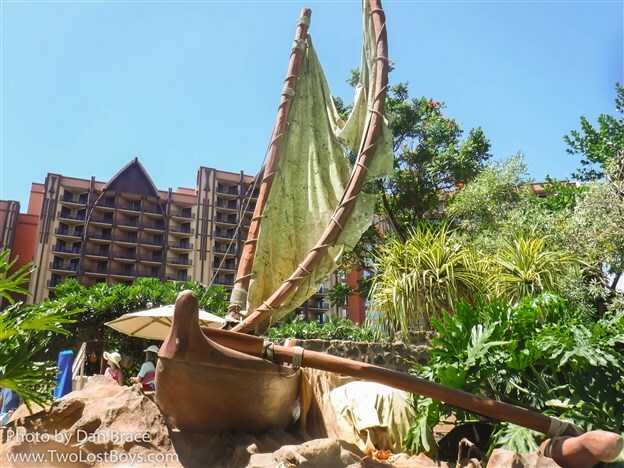 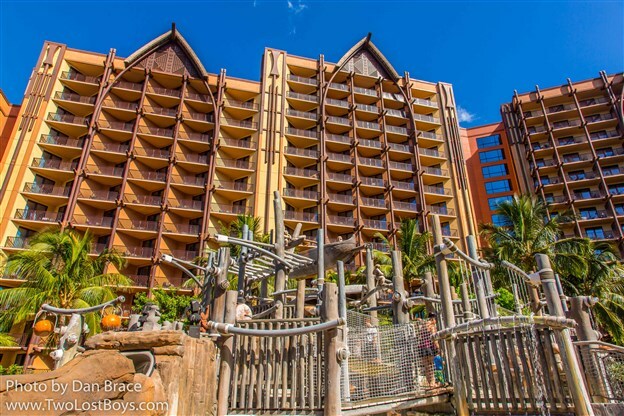 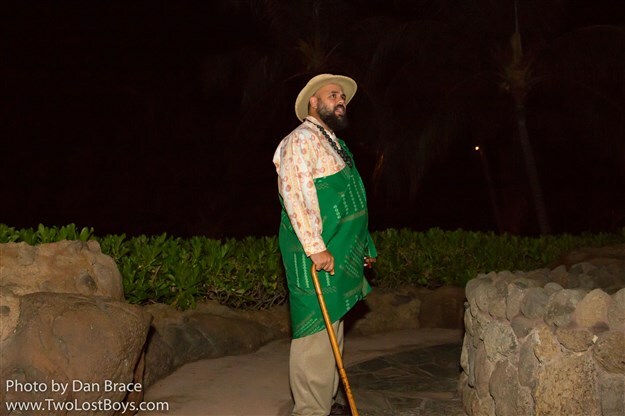 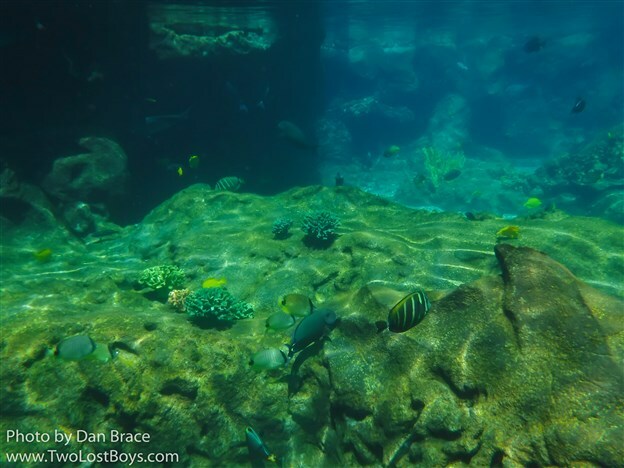 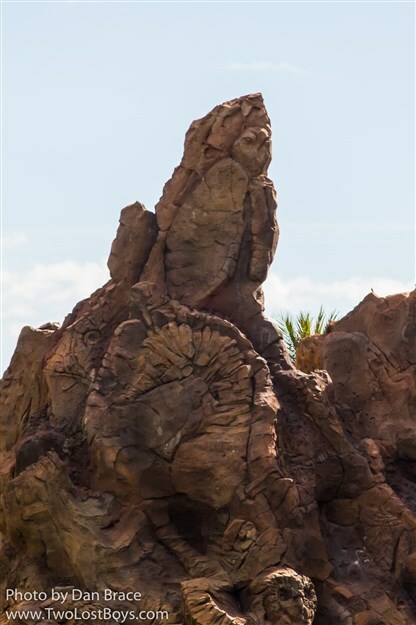 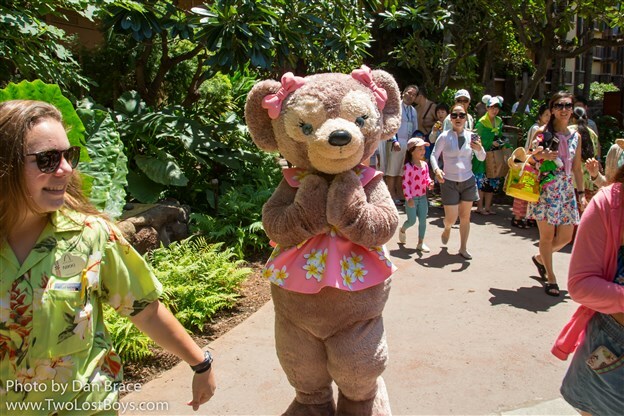 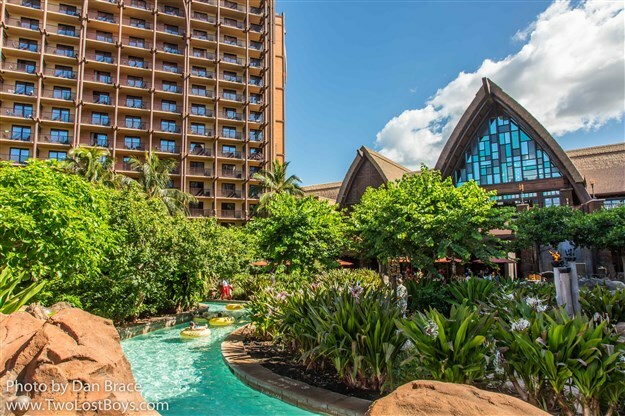 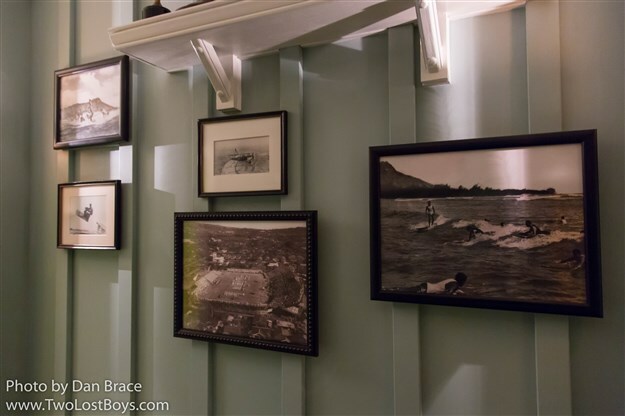 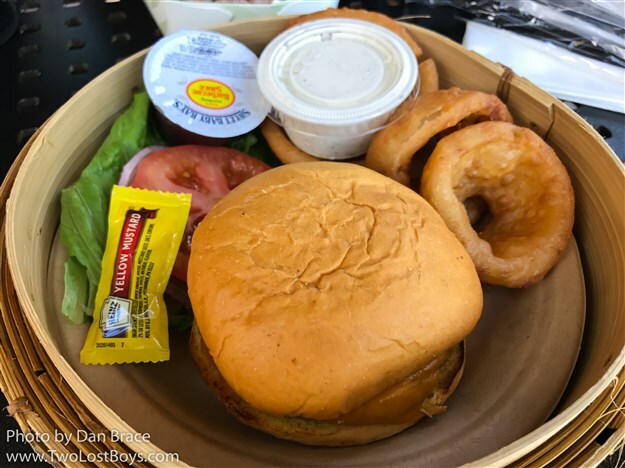 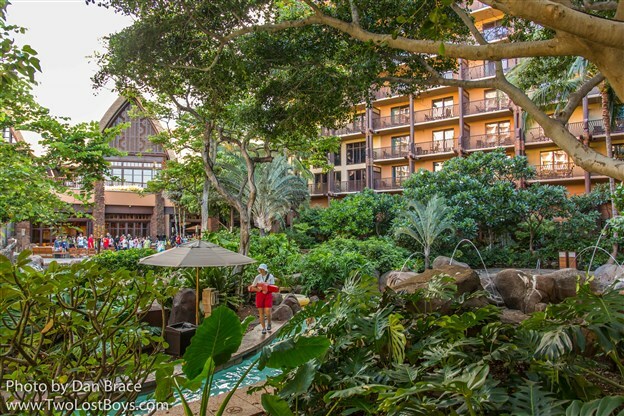 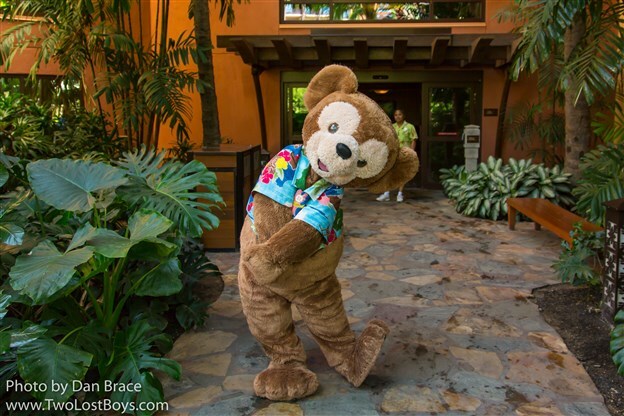 If it wasn't already obvious, we love taking photos of characters - it's our number one thing to do at the Disney Parks - however, we felt a little let down by some of the experiences we had at Aulani. 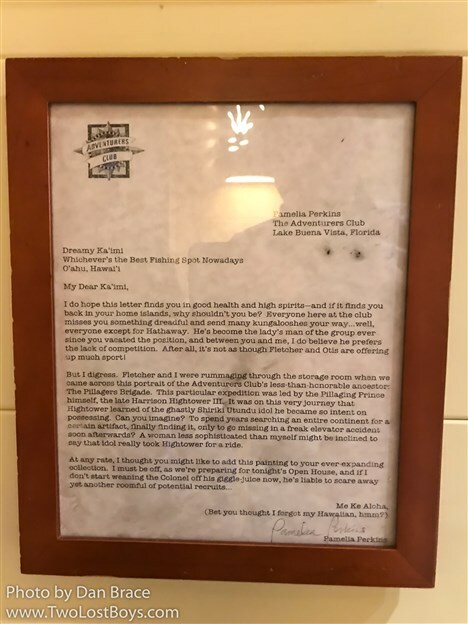 I want to make it clear - very clear - that we have no issue at all with the cast, the performers or their friends - in fact, all of them were exceptionally nice, friendly and helpful. 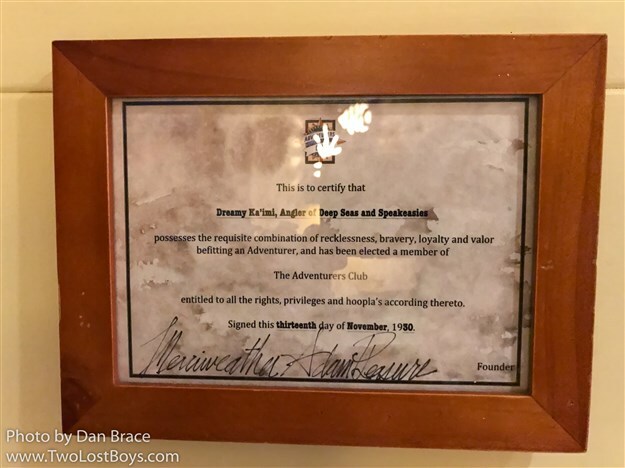 Our experience was marred by the organisation and the policies in place for meeting characters, which I guess must come from a higher level that doesn't visit "on the ground" very often. 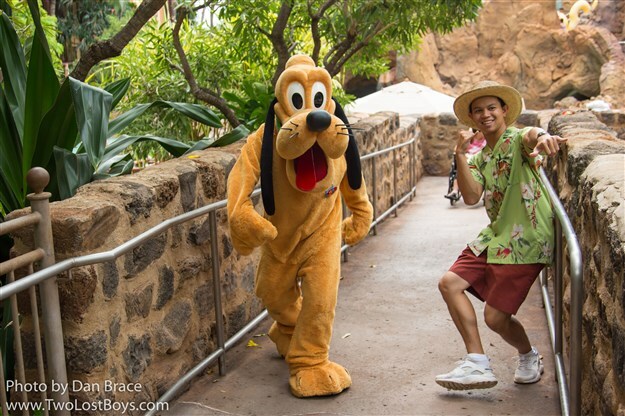 Characters are not out for very long at all during the day. 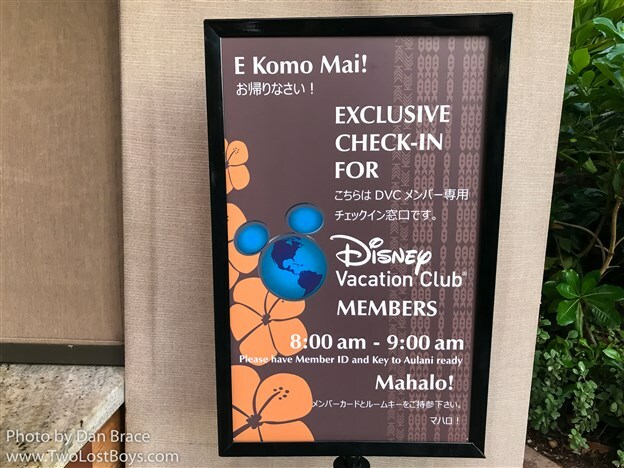 Just a couple of hours around lunchtime, and then there are no more scheduled appearances (incidentally, to find out scheduled appearances you must call a hotline after 8am everyday). 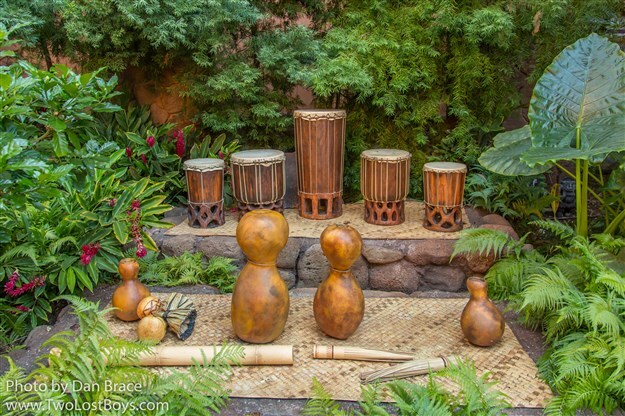 However, there are random "walk around" sets that happen periodically. 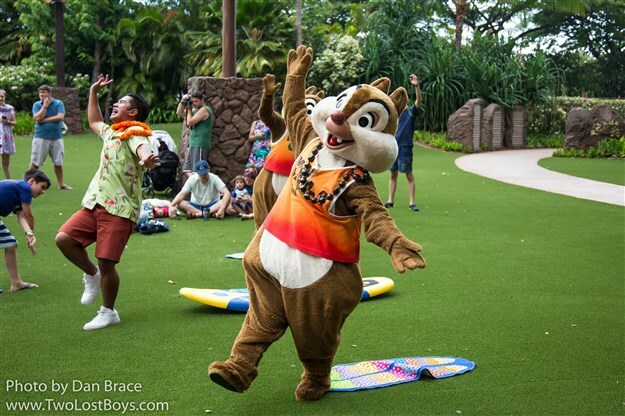 During these you can not meet the character and they move very quickly around the resort, being "cute" for the flash mobs of people that appear when the characters come out. 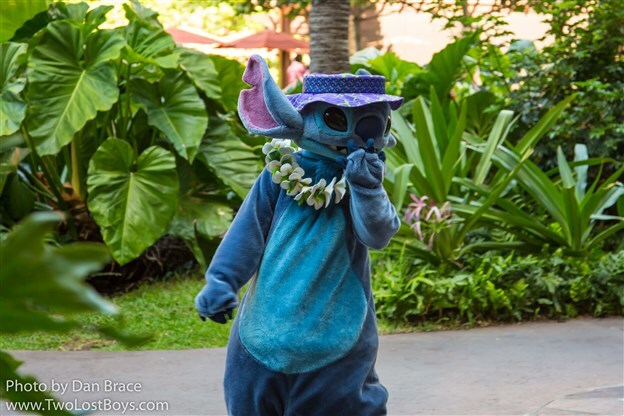 It was quite stressful and sometimes a little intense trying to get good photos of the characters when there were hoards of people trying to get photos as the characters are on their stroll. 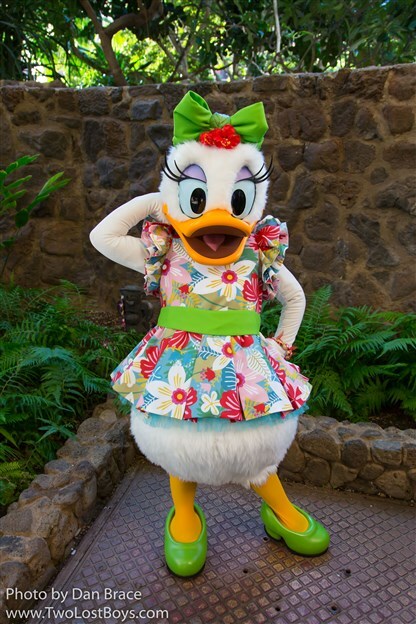 In fact, in three days, we never once saw Daisy, Duffy or ShellieMay out for regular greetings - only on strolling sets. 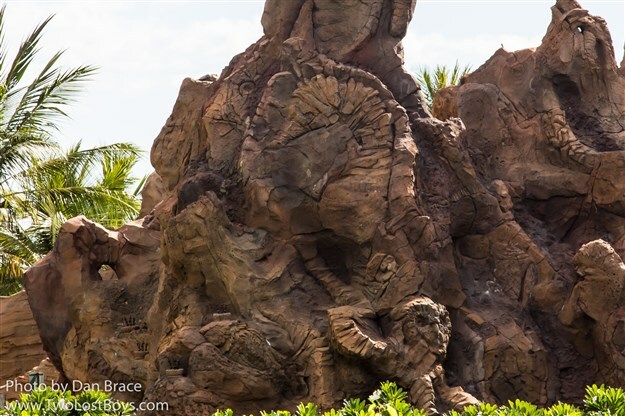 It was frustrating knowing that they have these characters but on any given day you could see all of them, or only three or four of them out. 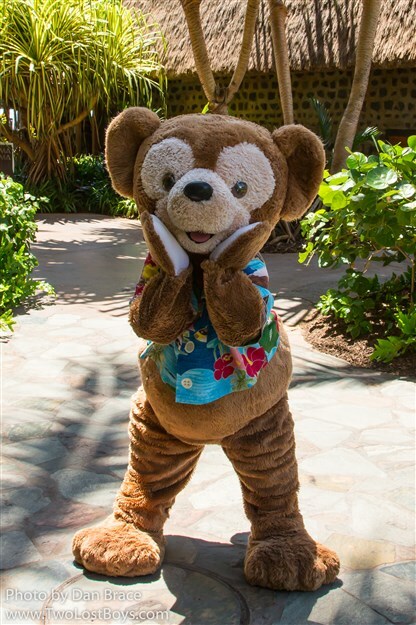 Some days there would be a great selection of greeting characters, another day would be just Mickey, Minnie and Moana, with other, more varied characters such as Duffy and Stitch only walking about. 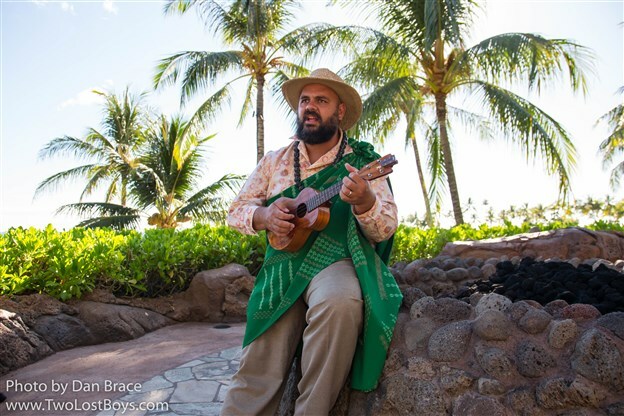 Also, the lines were very long, and if you do not arrive early for the set times, you might not get to meet anyone at all. 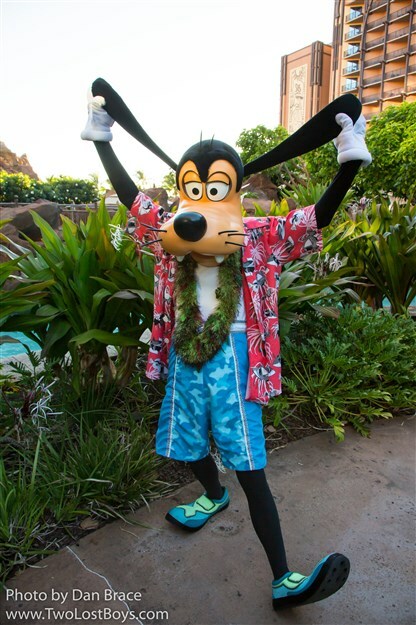 One of the coolest character greeting experiences, and one that I had really hoped to see while at Aulani, was meeting Goofy in the pool. 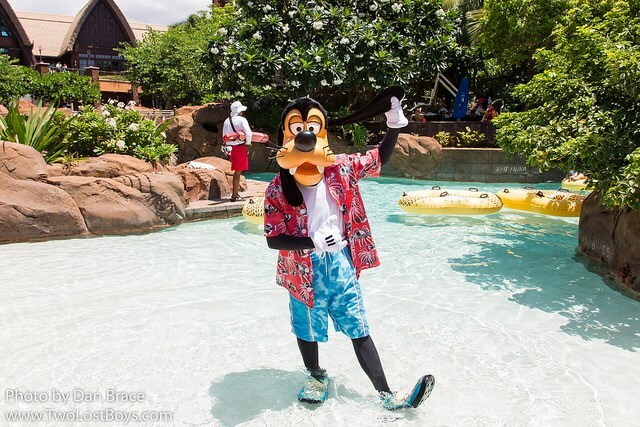 It's really fun and neat to be able to stand in the water with a Disney character! 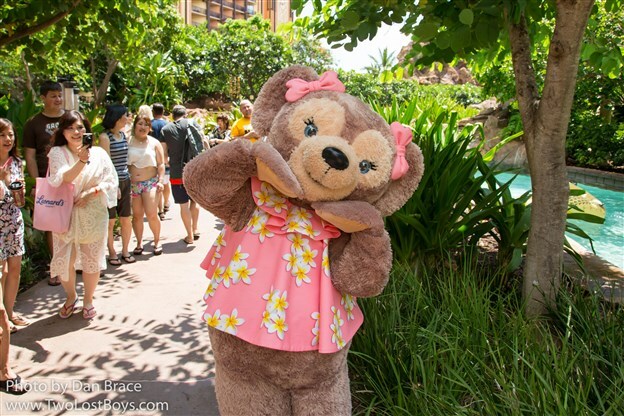 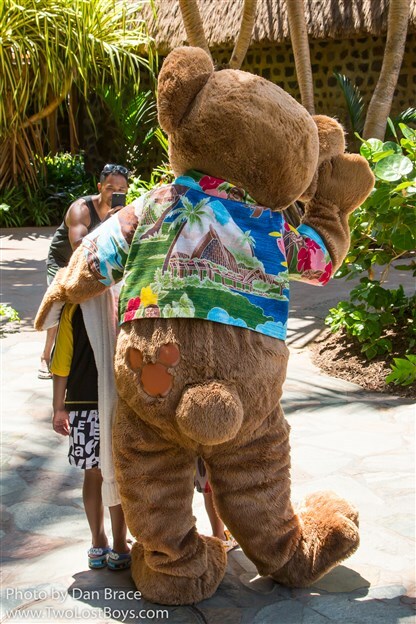 All in all, meeting characters in Aulani proved to be a little irritating, but we were very glad at least to see them in their special Aulani outfits; Duffy's shirt, which depicted Aulani on it, was a particular favourite of mine. 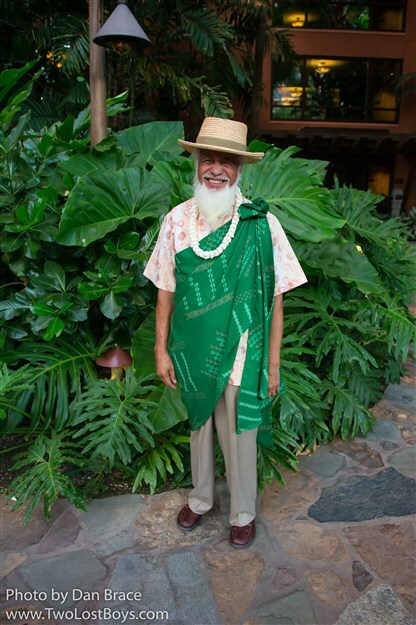 I have thrown in some photos of some of the aunties and uncles below, too, for good measure! 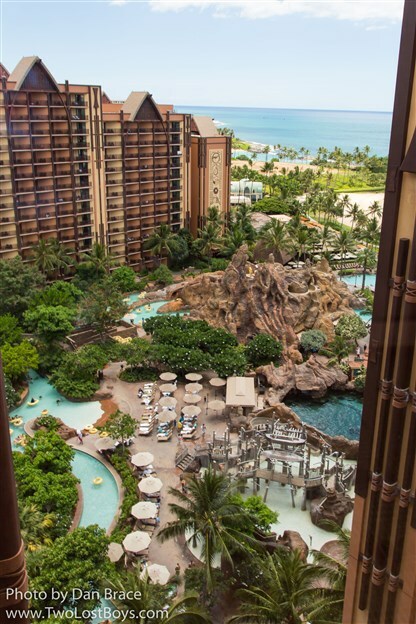 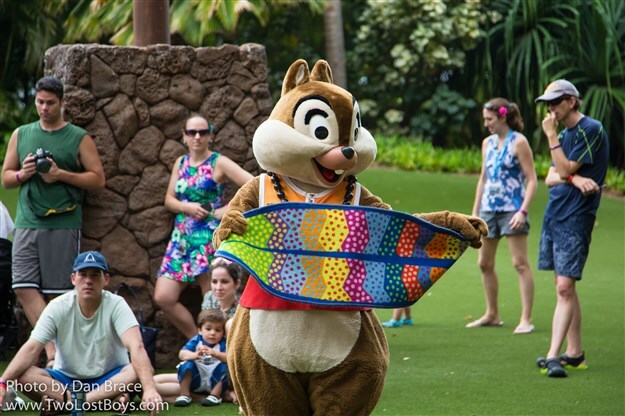 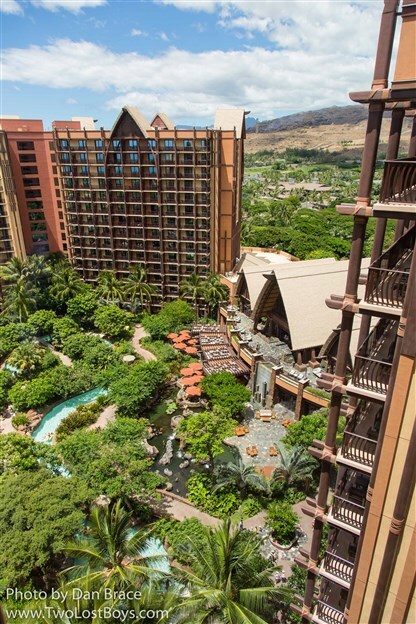 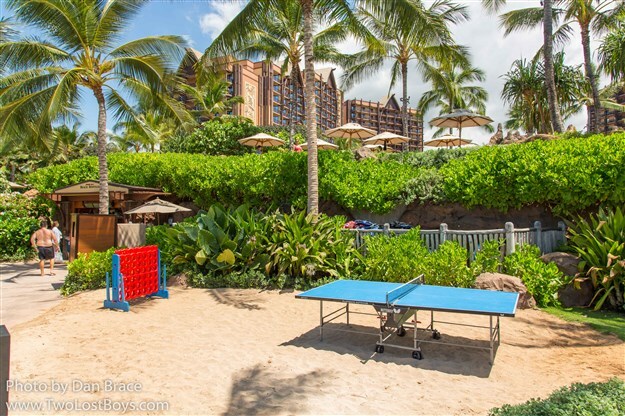 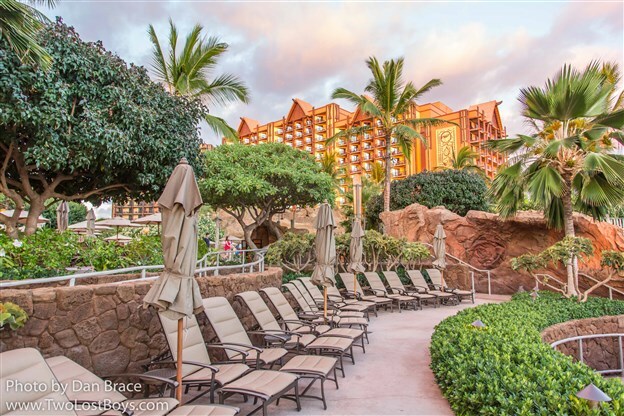 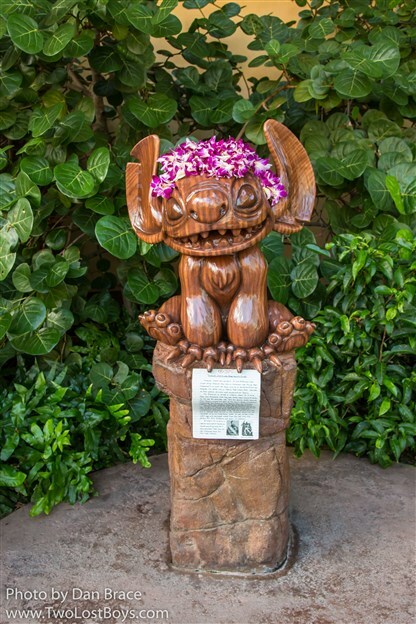 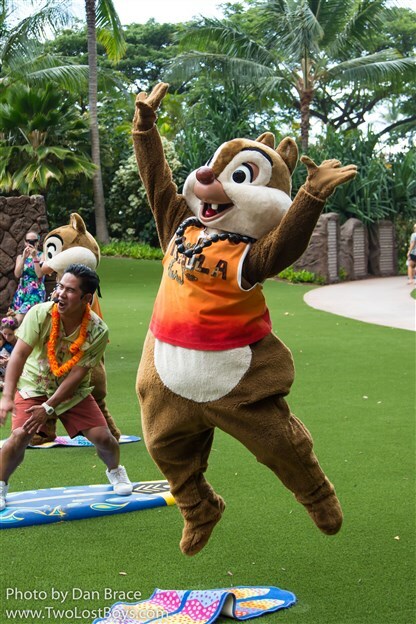 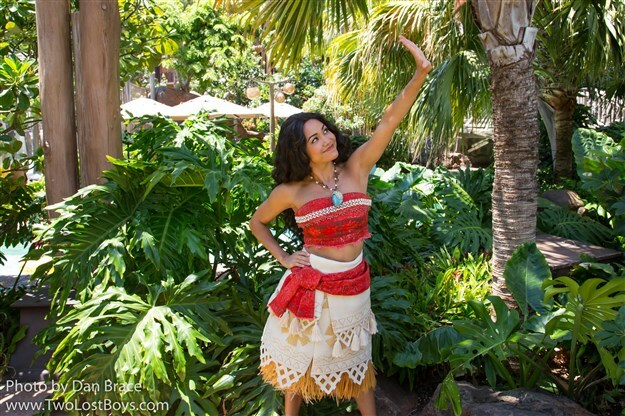 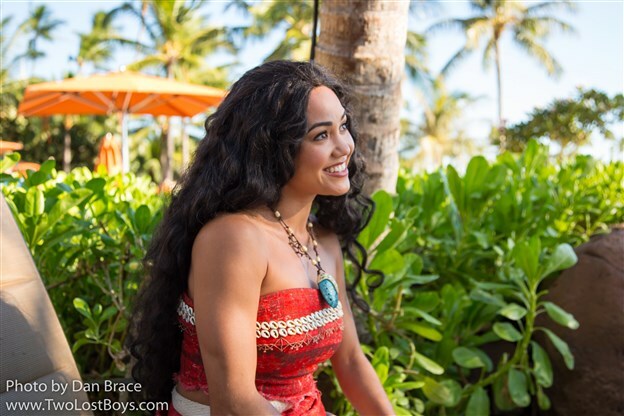 Aulani has a number of entertainment offerings that happen throughout the week, including learn to surf with Chip and Dale, a pool party with Mickey, a luau, and storytelling with Moana. 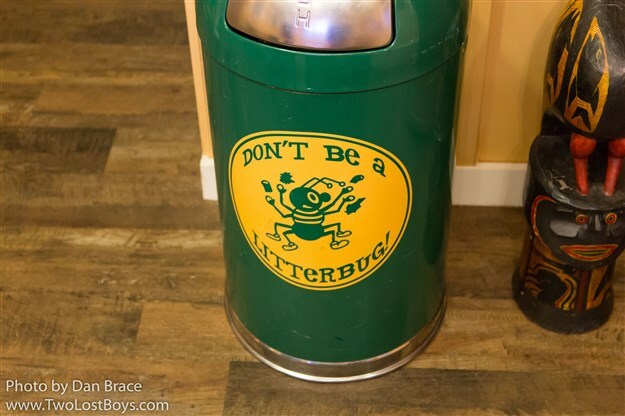 Unfortunately, much like the character greeting situation, it is random on any given day as to whether these things will happen, and are hard to plan for in advance. 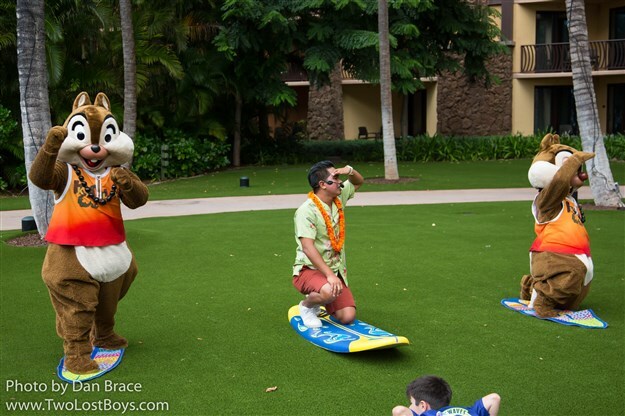 We did not get to see the pool party as it was not scheduled during the days we were there, but we did see the surfing lesson. 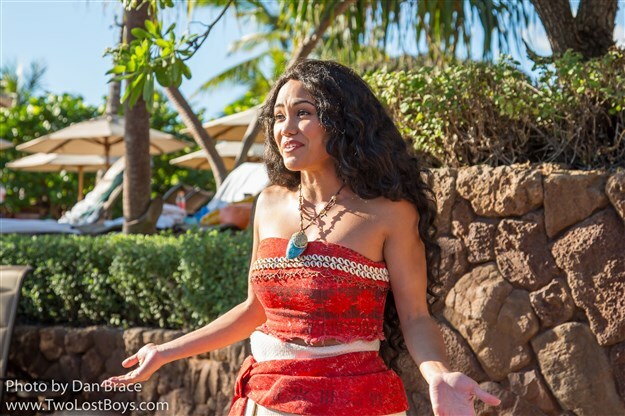 We did also see the storytelling a couple of times, and one occasion had no characters, and another time we saw it Moana was present - and there was no pre-warning either way as to whether she would be there or not. 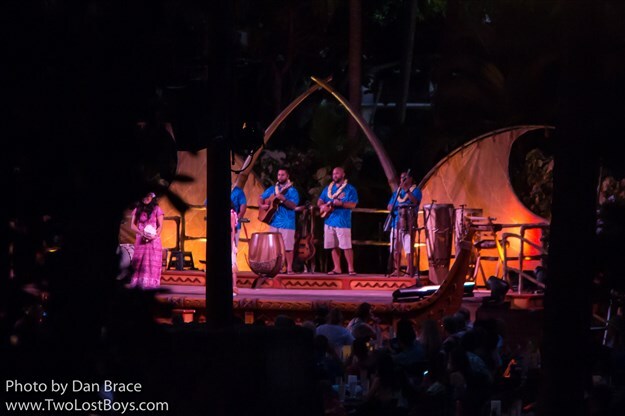 We also did not attend the luau as it was quite expensive, and we were initially told that it did not feature characters. 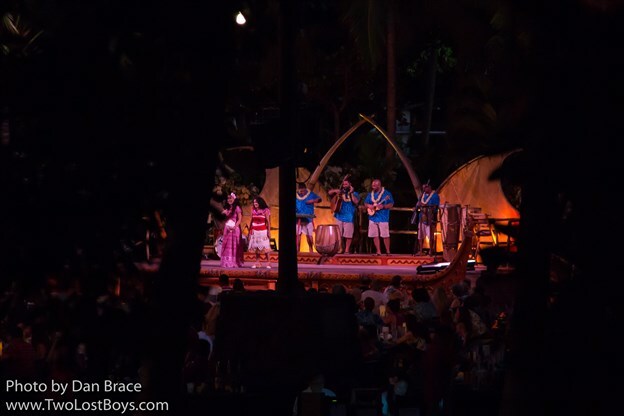 However, we could see part of the luau from afar from our room, and even if nobody else was present, Moana did make a very brief appearance during the show, from what we saw from our balcony. 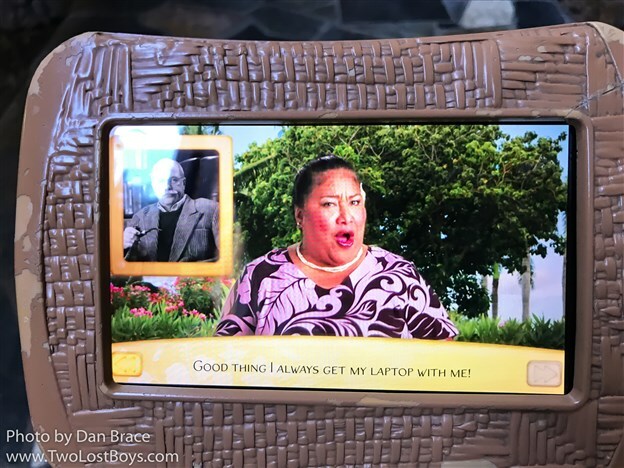 We hope to attend the luau on a future trip in the event that other characters do indeed make random appearances. 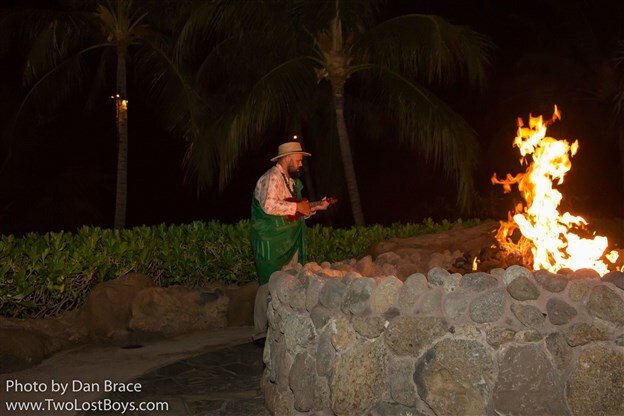 I actually really enjoyed the fire pit storytelling with the resident uncles. 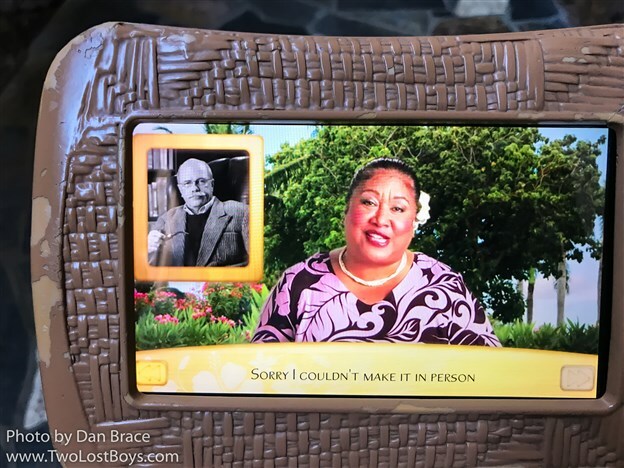 I felt that they really put a lot of passion into the storytelling, and I felt I learned a lot about Hawaiian history and culture through them. 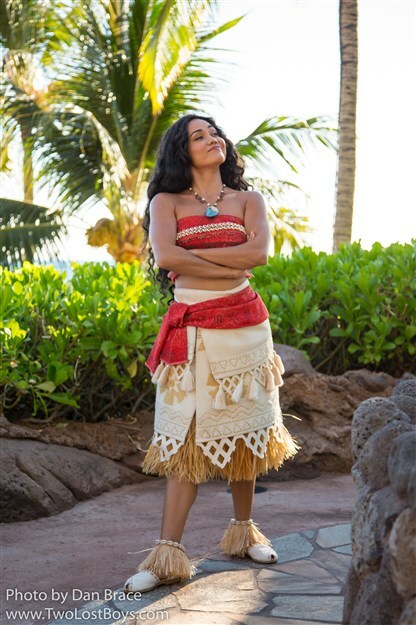 Regardless of Moana being present or not, they are very worthwhile to attend. 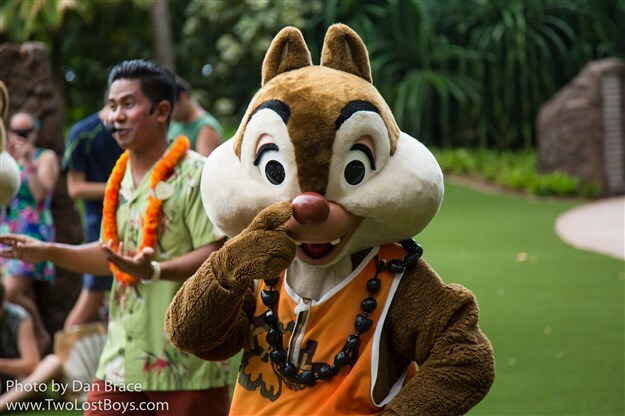 Let's take a look at some photos from the various entertainment offerings we saw. 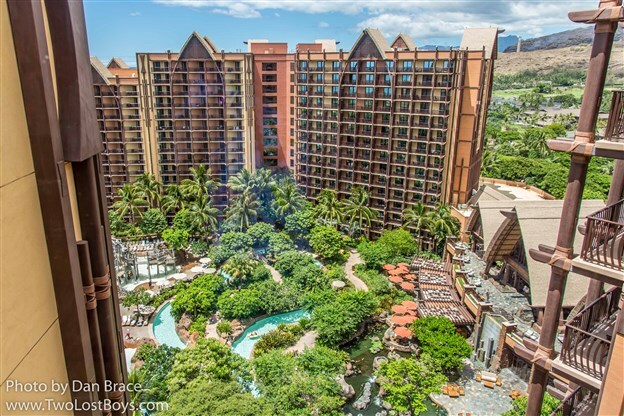 Finally, before we finish this report, I want to share with you some photos that I took from the 16th floor landings in both towers. 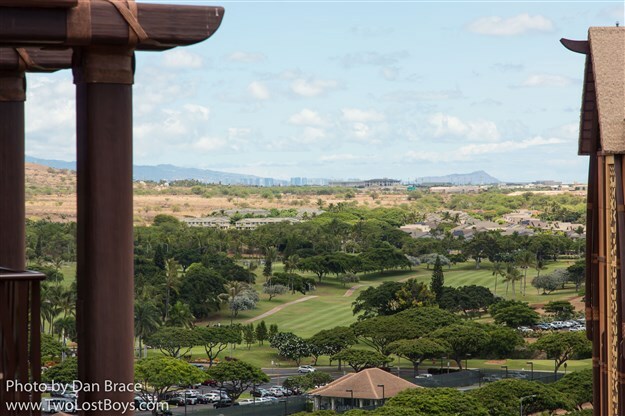 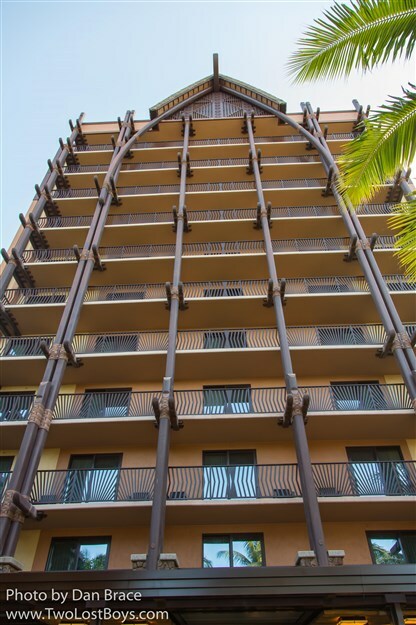 They offer spectacular views over the resort, and even out towards Honolulu. 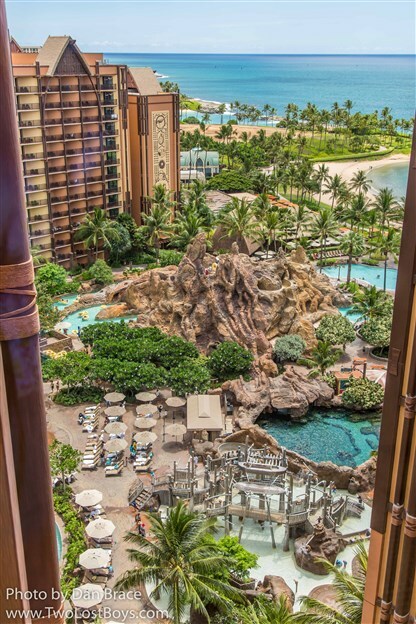 You don't have to be in a suite or anything - just hit 16 in the elevator and enjoy the views! 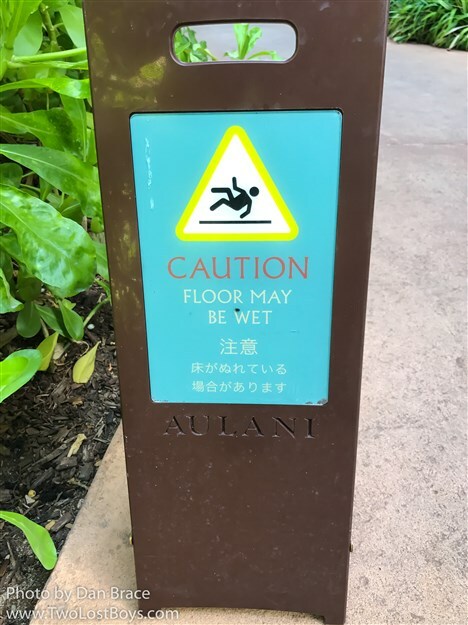 Ok, that's everything for this report! 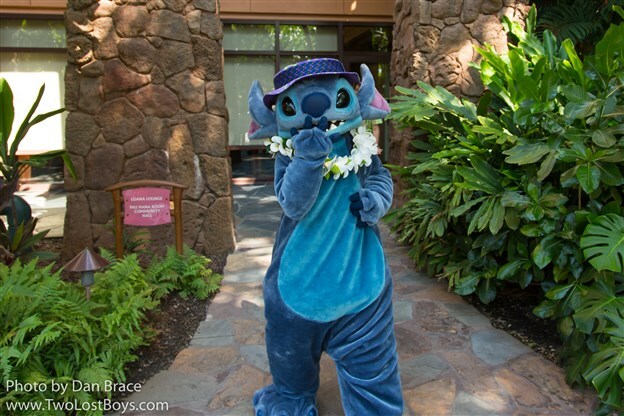 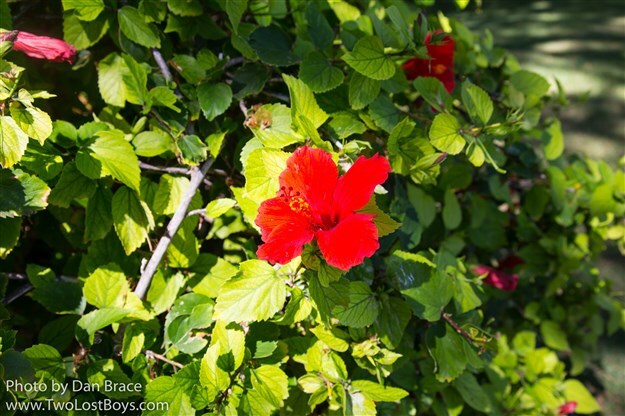 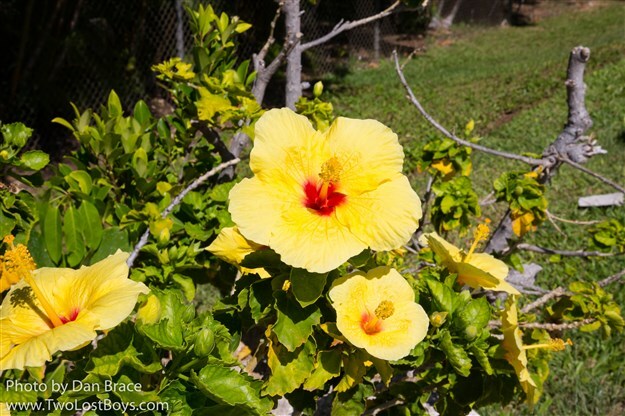 I hope you have enjoyed following along on our Hawaiian adventure.